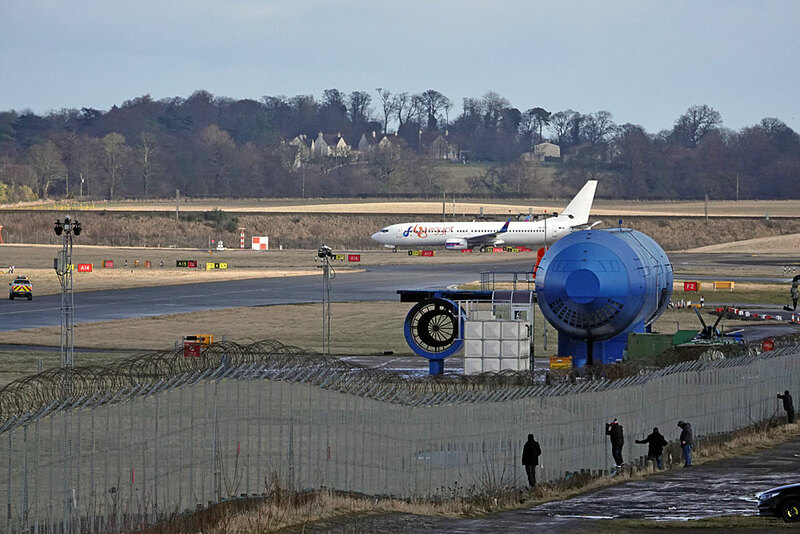 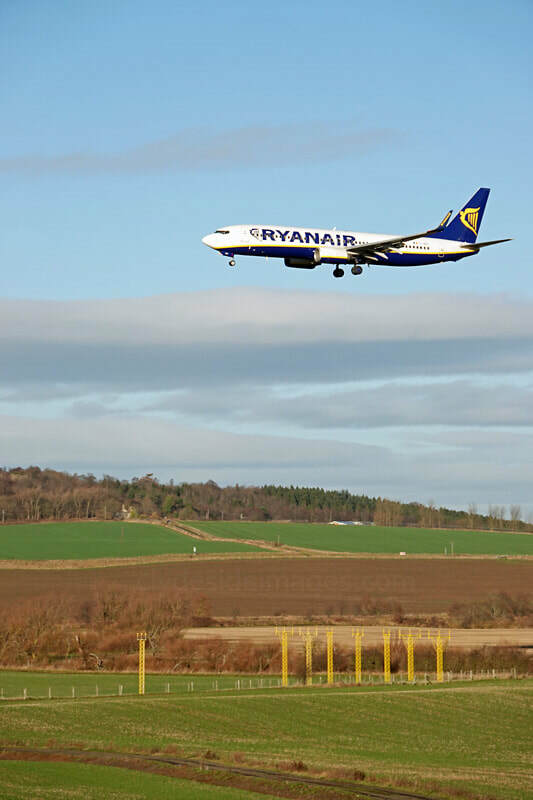 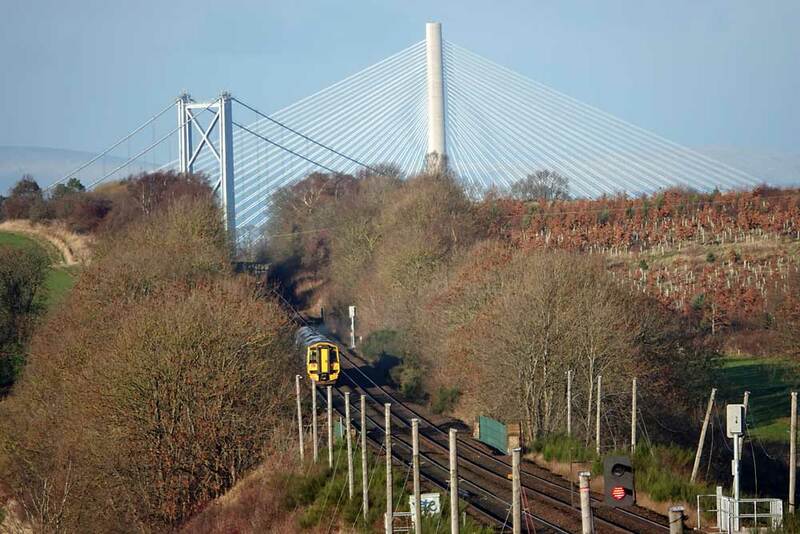 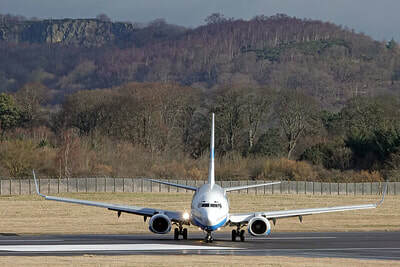 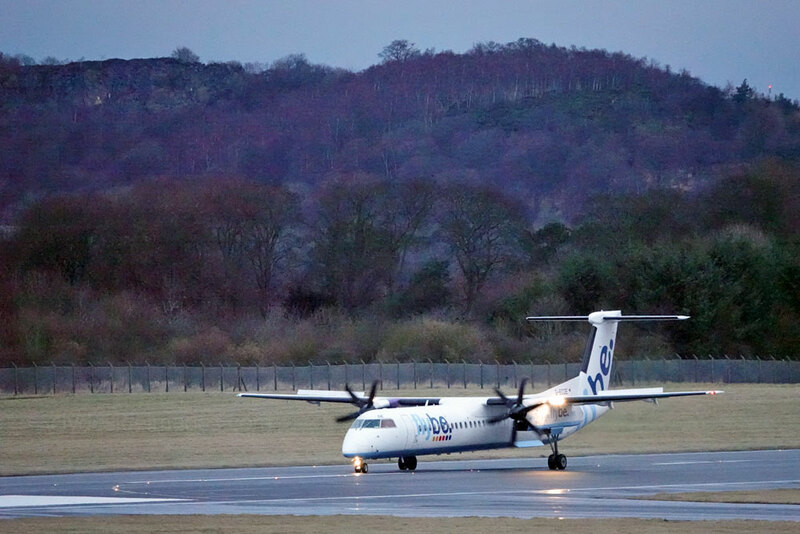 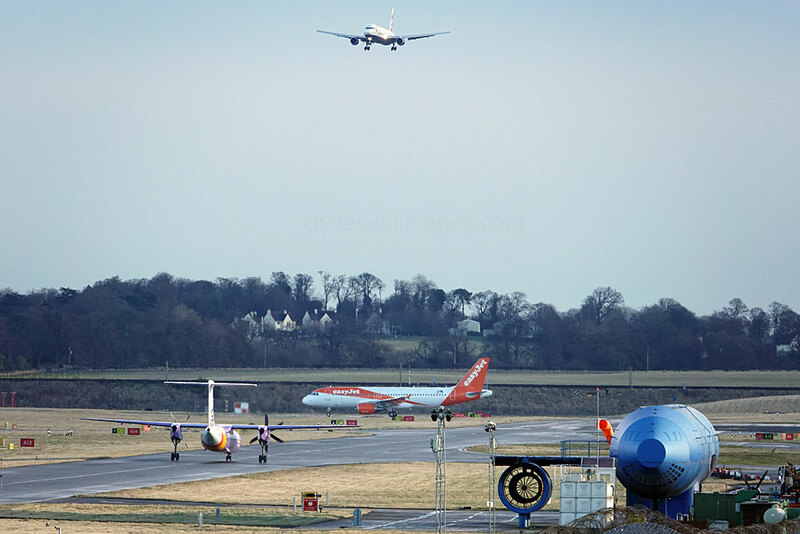 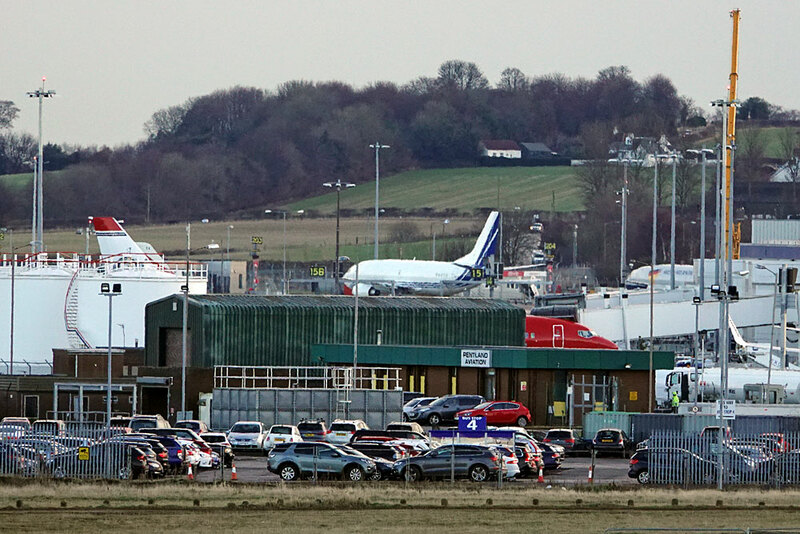 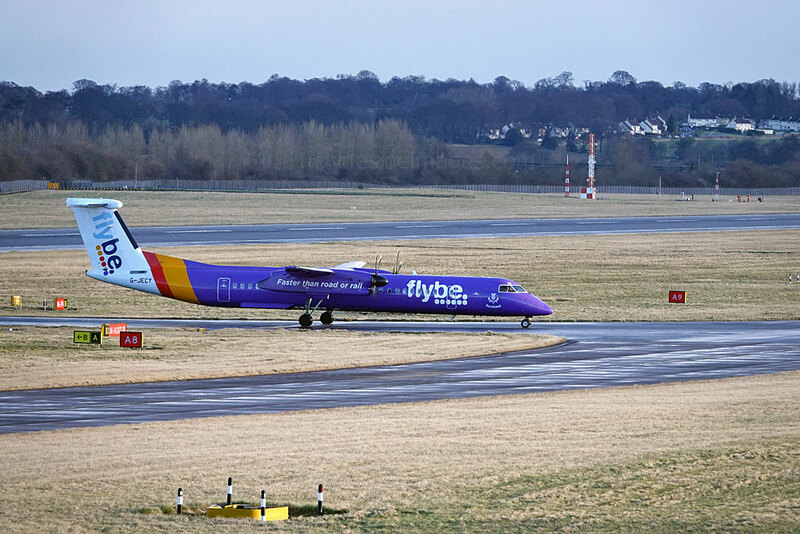 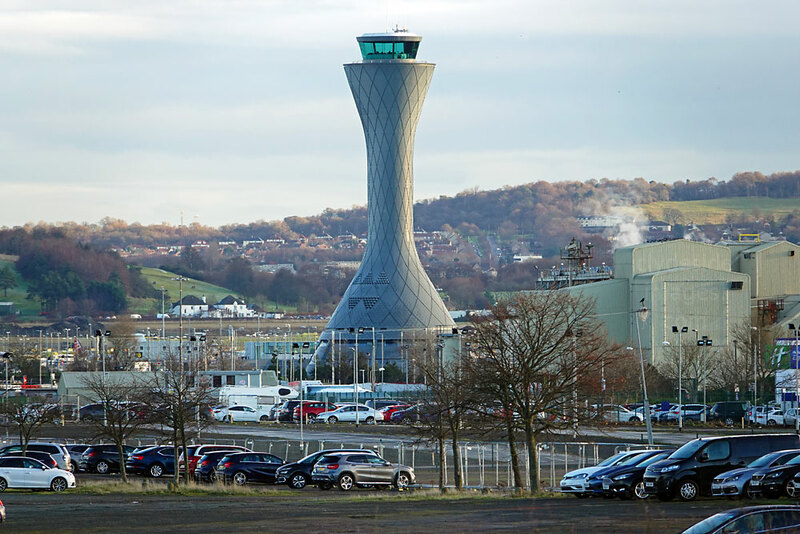 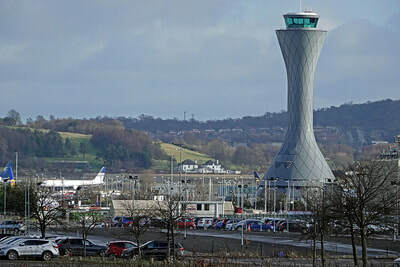 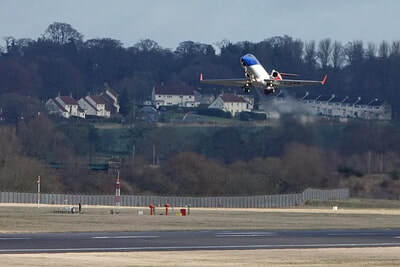 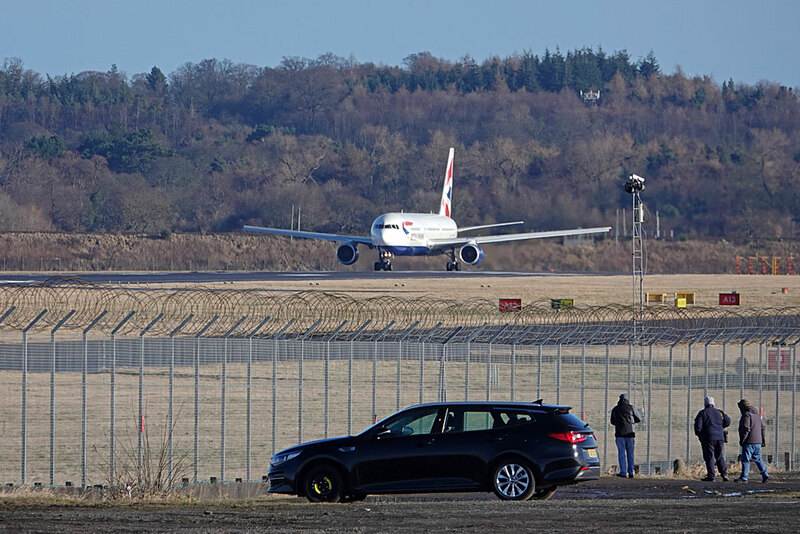 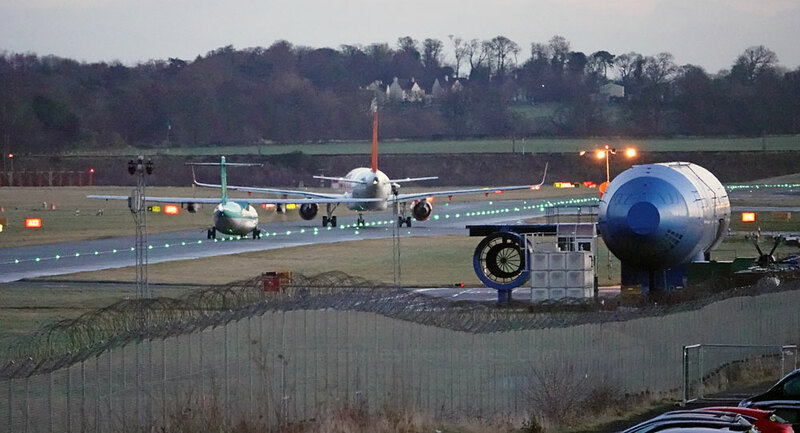 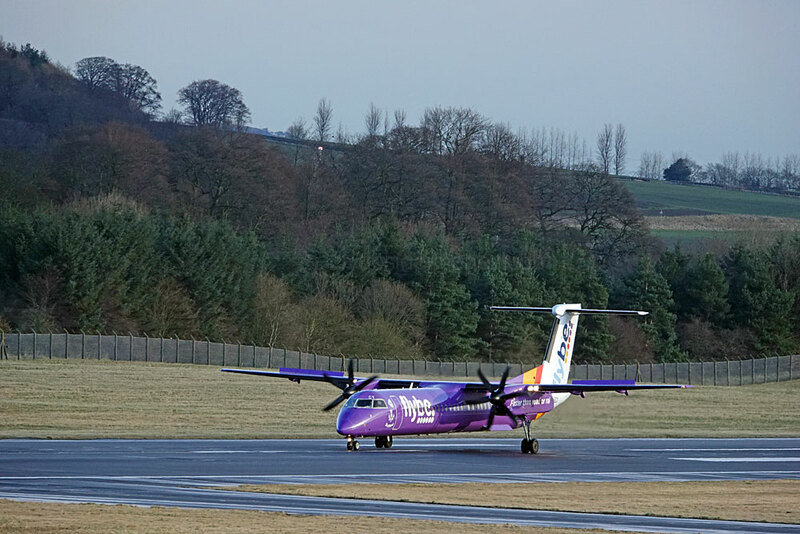 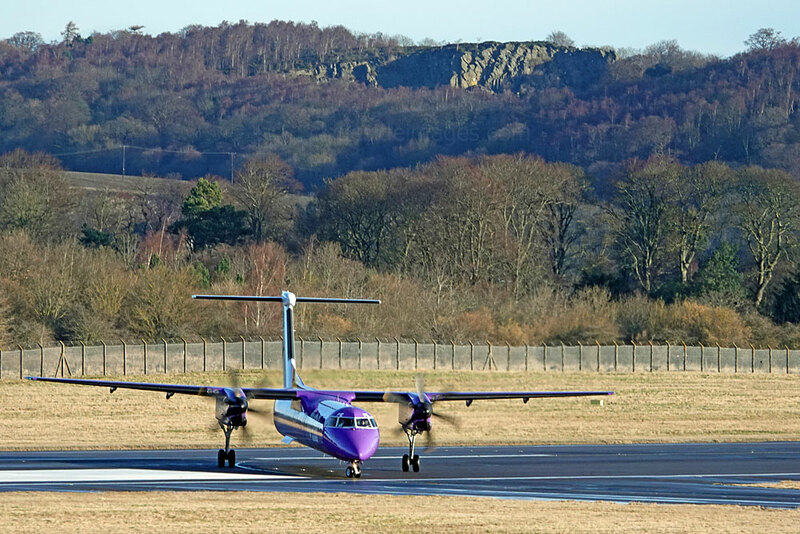 I don`t go through to Edinburgh Airport very often, mainly because of the frequent congestion on the M8 motorway, but I hope to visit more regularly next year. 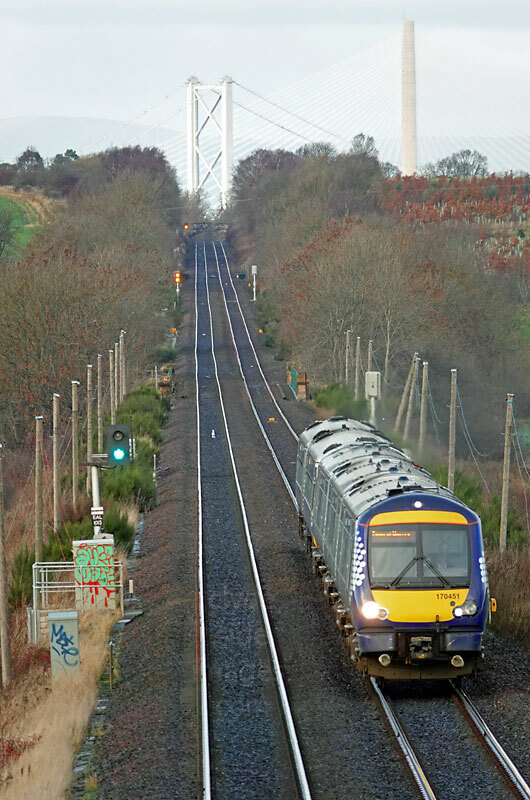 Meanwhile, just three trips from 2018, the most recent being on Sunday 9 December which is shown at the top of the page. 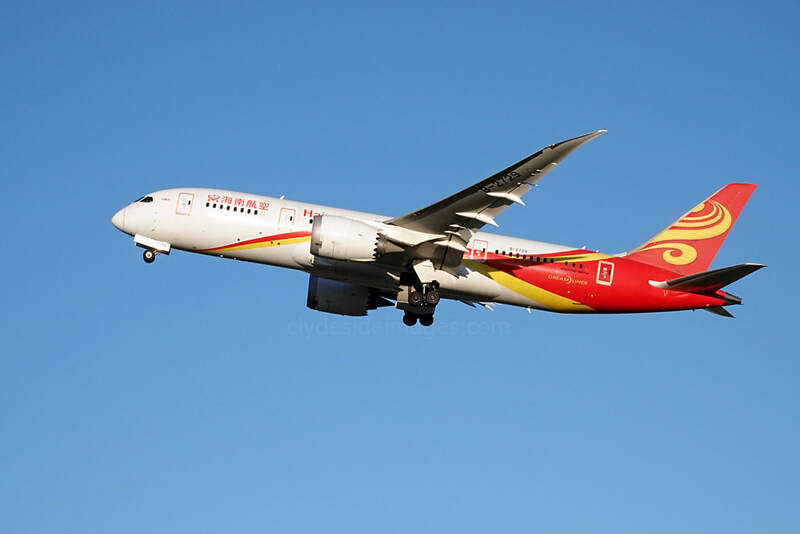 With excellent weather forecast, I arrived before first light in time to catch Hainan Airlines Boeing 787-8 Dreamliner B-2729 arriving from Dublin to pick up additional passengers at the Scottish capital before heading back to China. 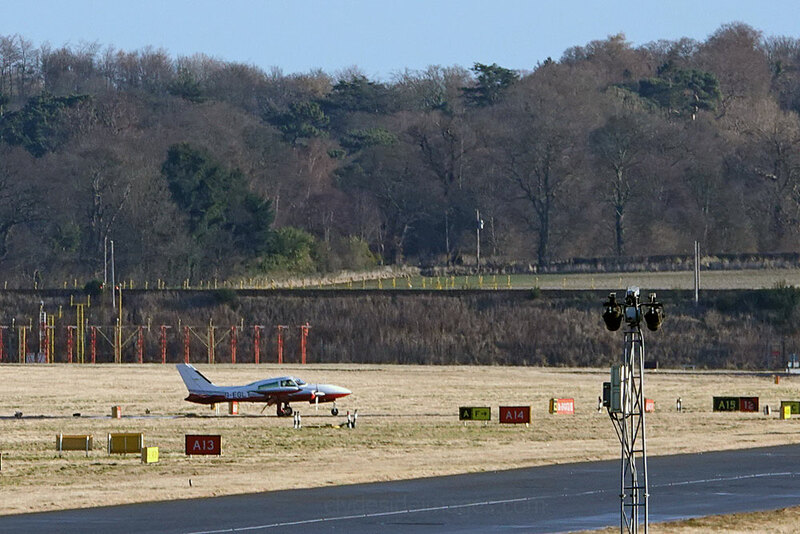 Runway 24 was in use and after spending most of the morning on the Mound, I drove round to the Turnhouse side of the airfield and checked out the Lennybridge vantage point for the first time. 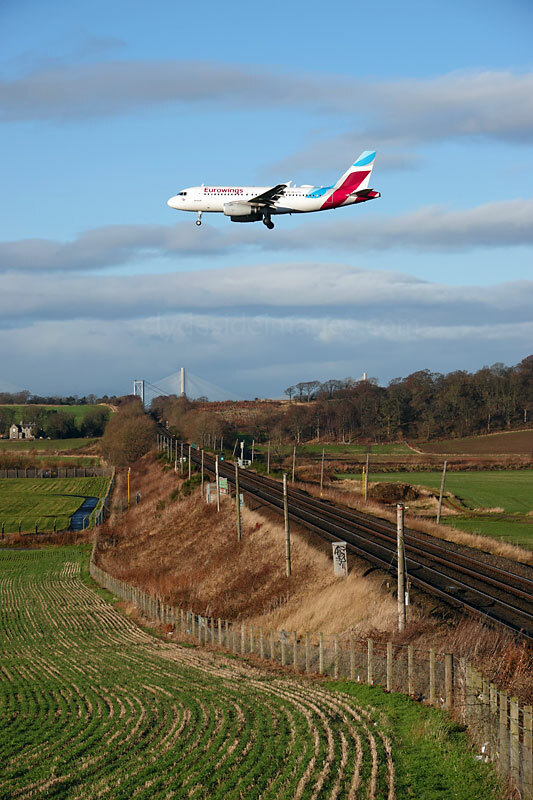 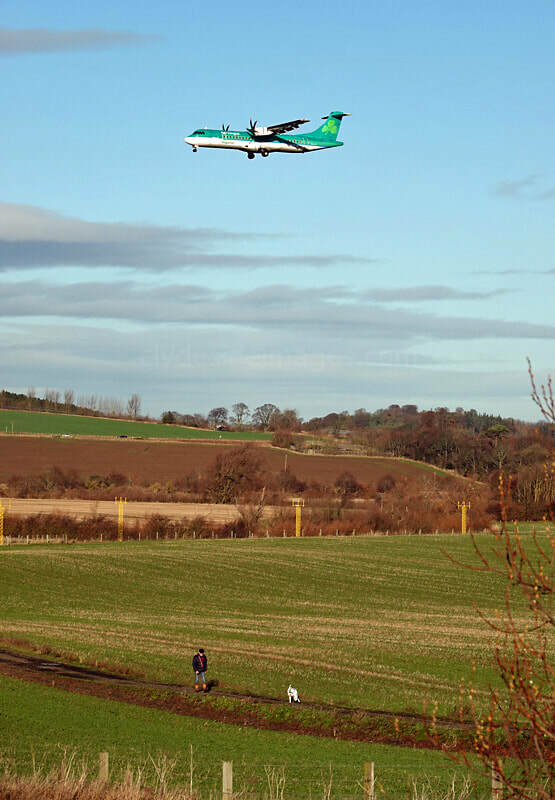 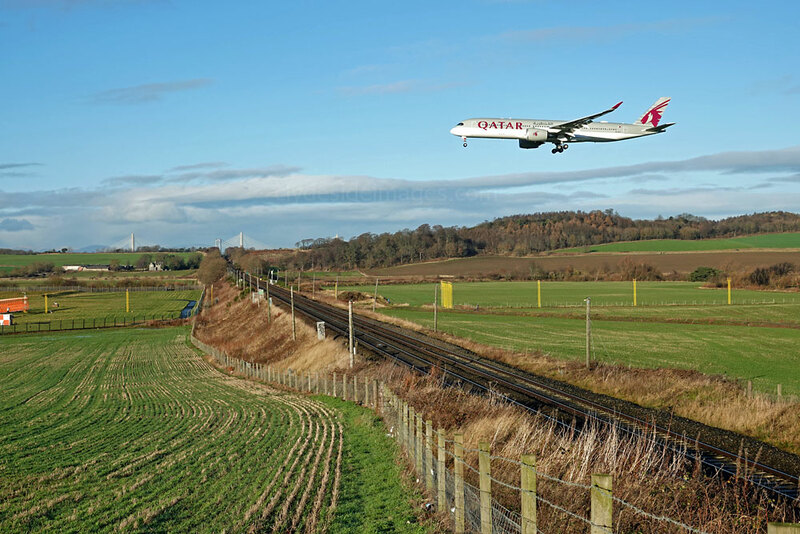 It`s easy to see why this is a popular spot with photographers as you get some great views of planes on finals if approaching from the north. 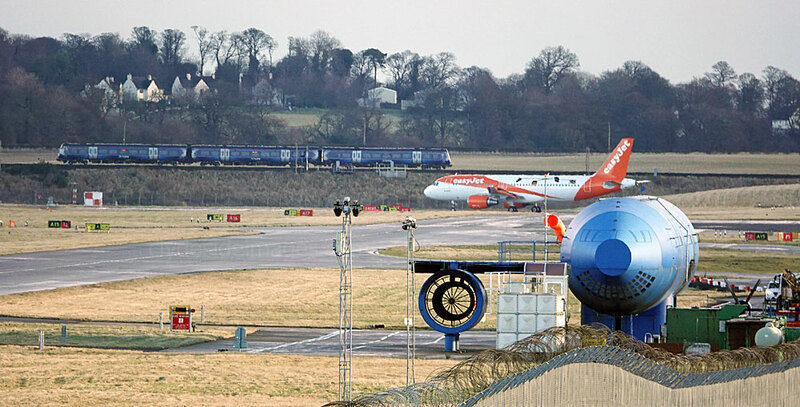 The railway line is very busy and although I never managed to catch a plane and train in the same frame on this occasion, it would be fairly easy to do given a bit of luck with the timing. 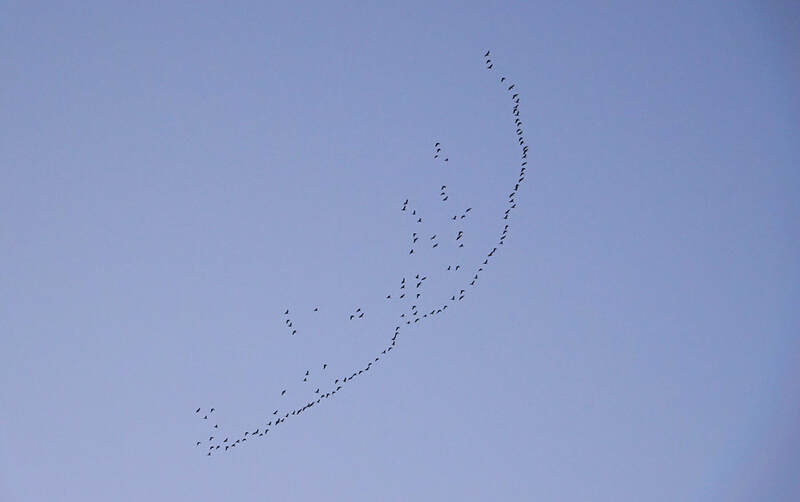 For half an hour around dawn, huge skeins of geese could be seen flying in a southwesterly direction against the lightening sky. 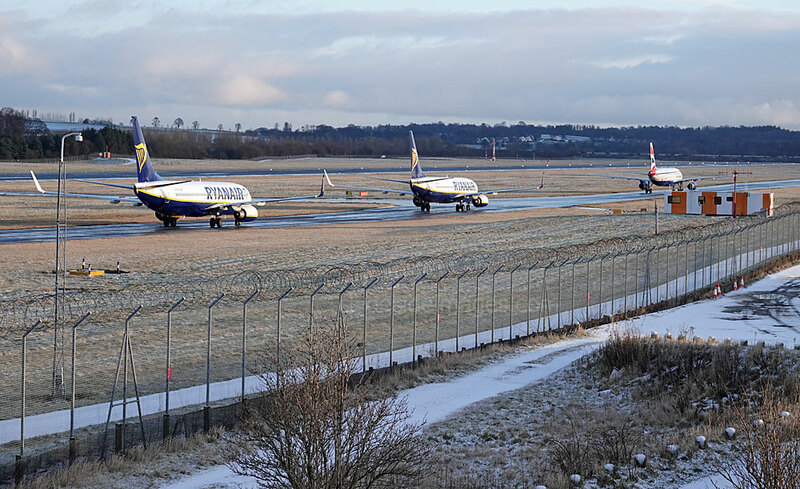 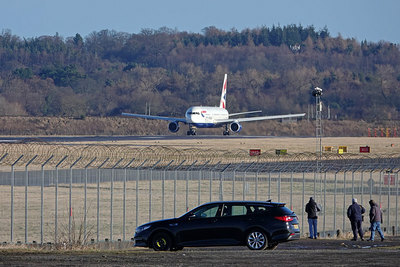 Although most were well above the flight paths into and out of the airport, the controllers gave frequent updates to planes on approach while a couple of jets, lined-up and ready to roll, sat for a few minutes until the closest birds were safely out of range. 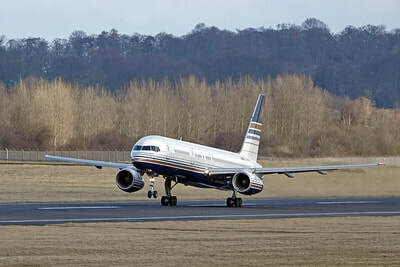 The only American airliner present was Boeing 757-224(WL) N34137 of United. 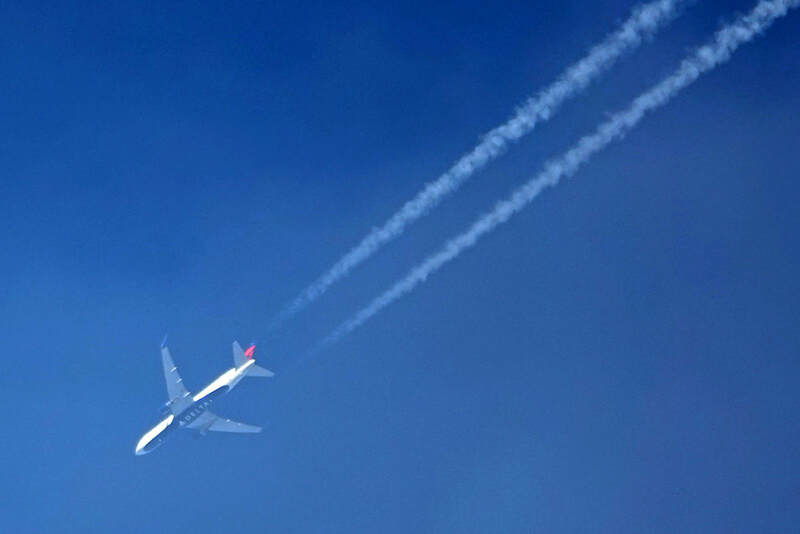 The Delta Airlines 767 (below left) overflew the airport at about 30,000ft. 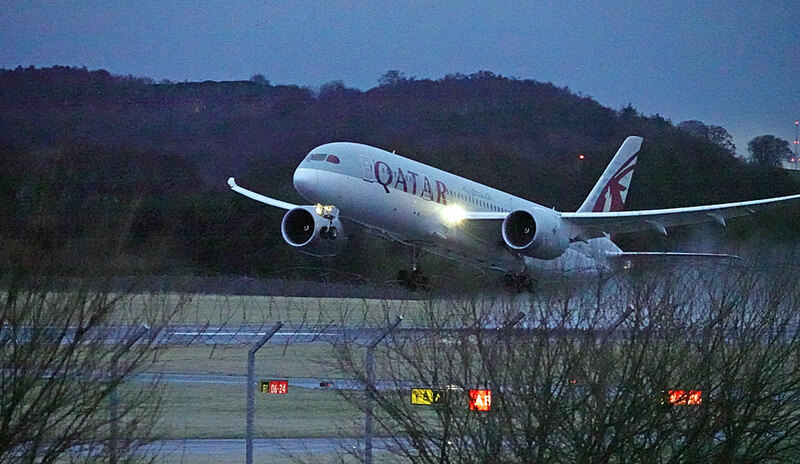 Once Qatar Airways Airbus A350-941 A7-ALT had touched down I headed home as it was nearly all domestic traffic scheduled for the next few hours. 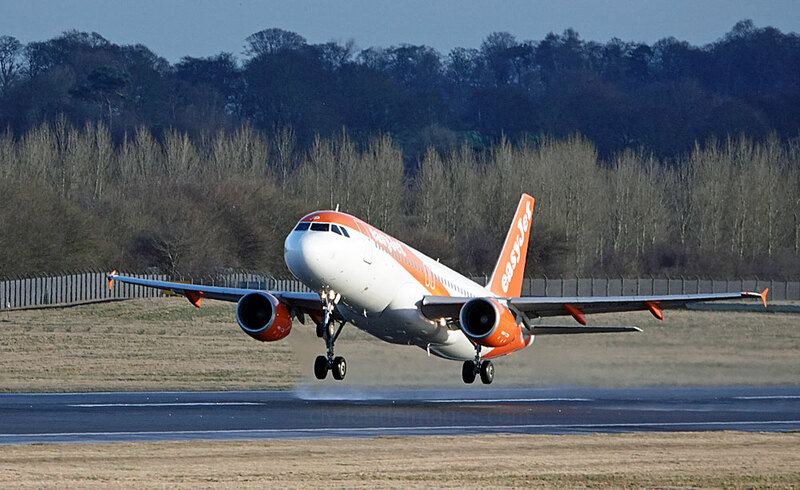 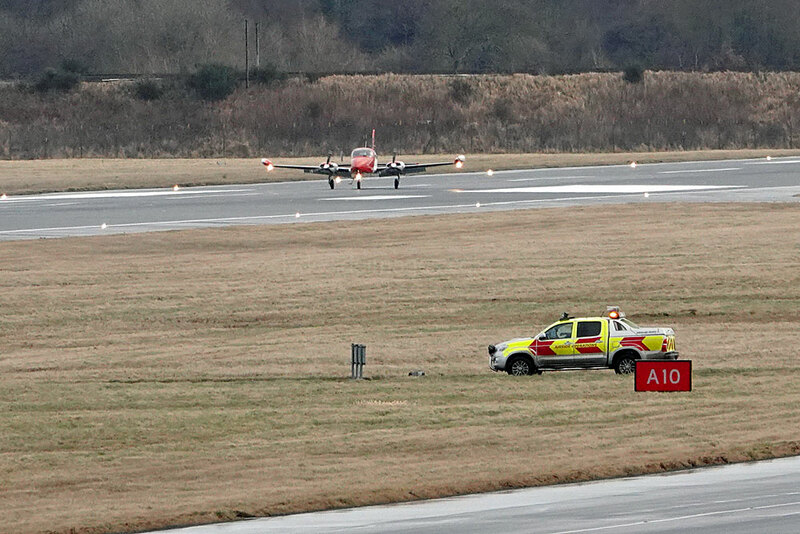 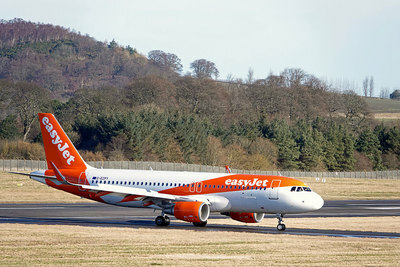 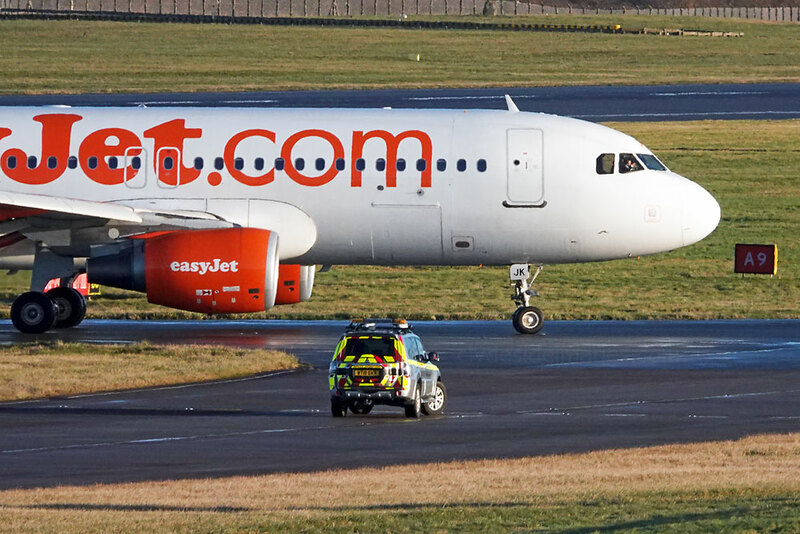 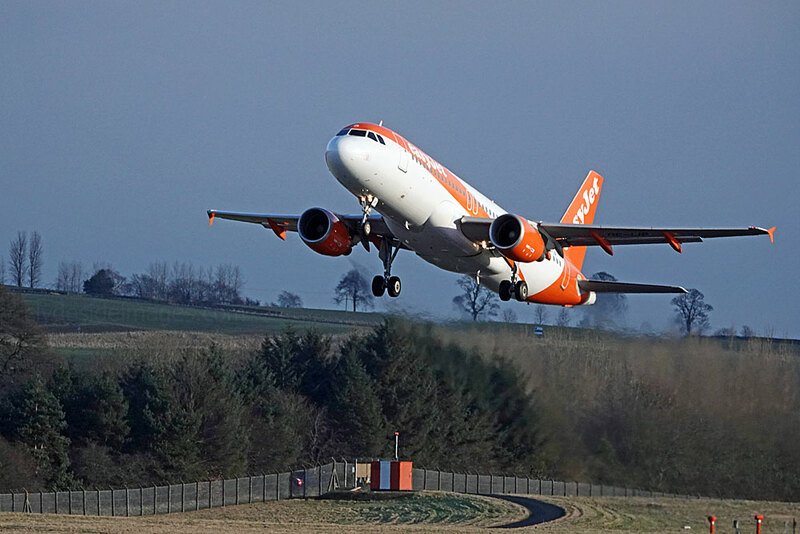 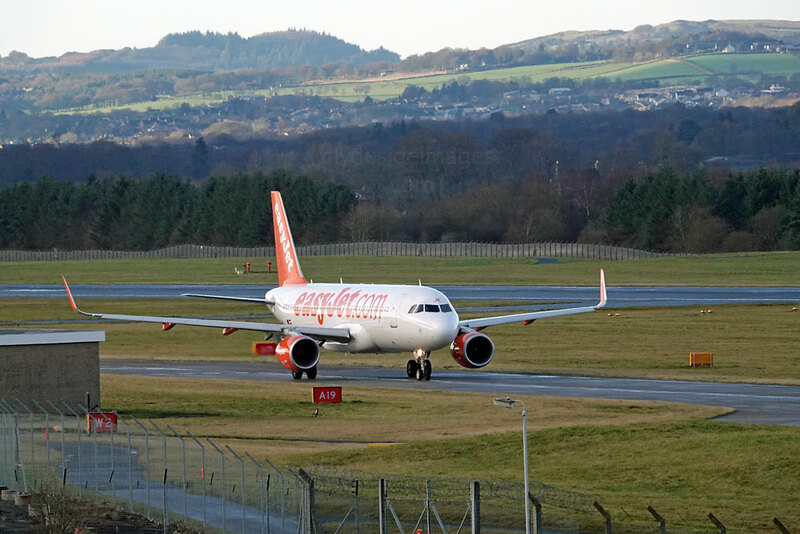 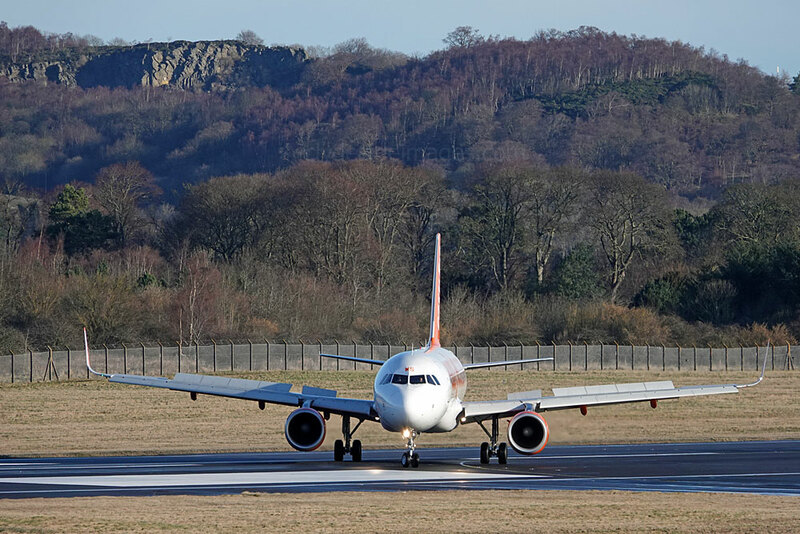 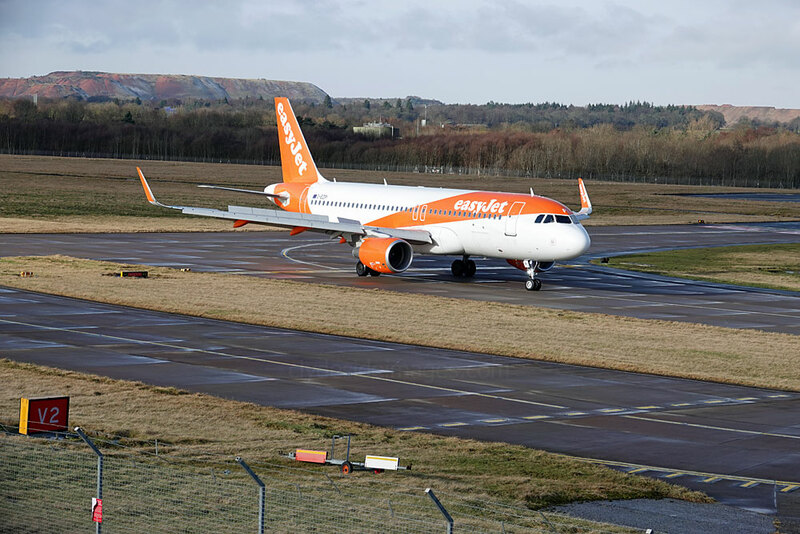 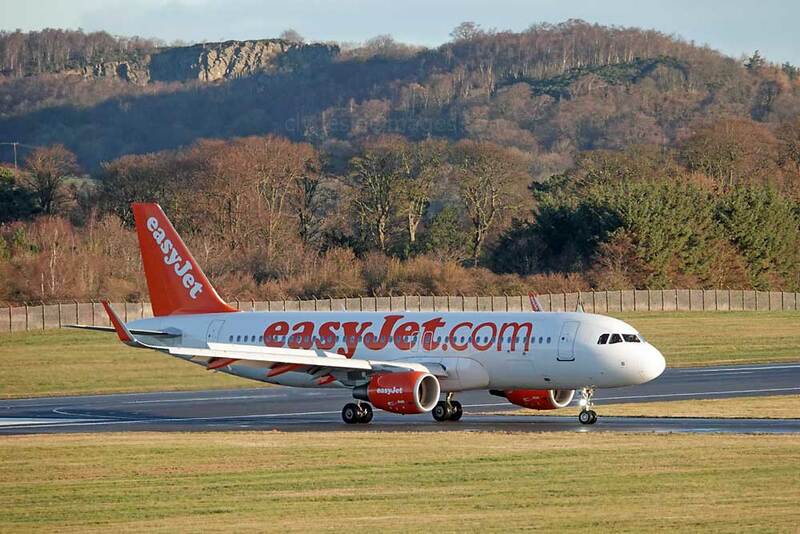 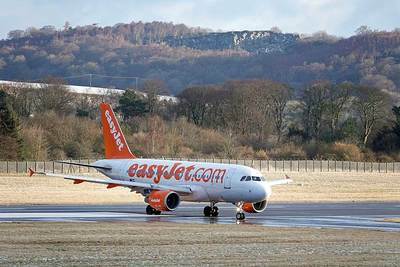 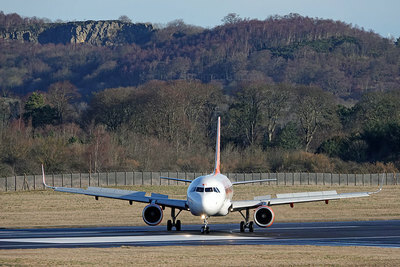 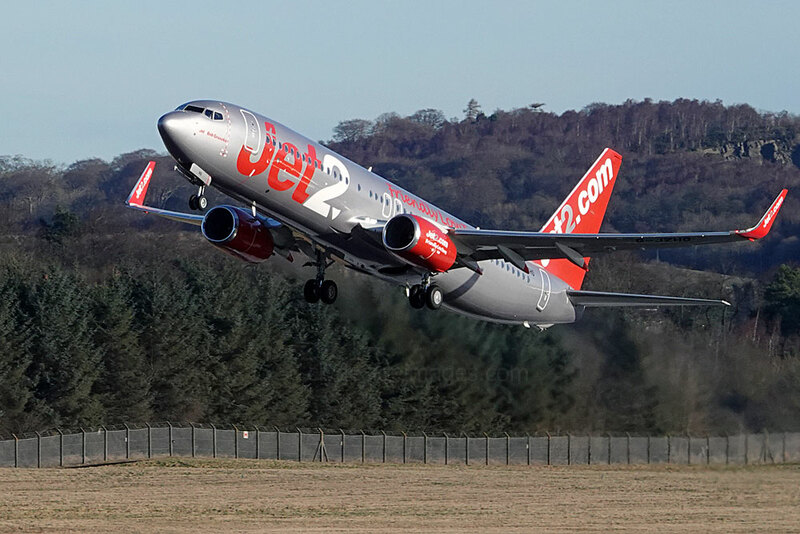 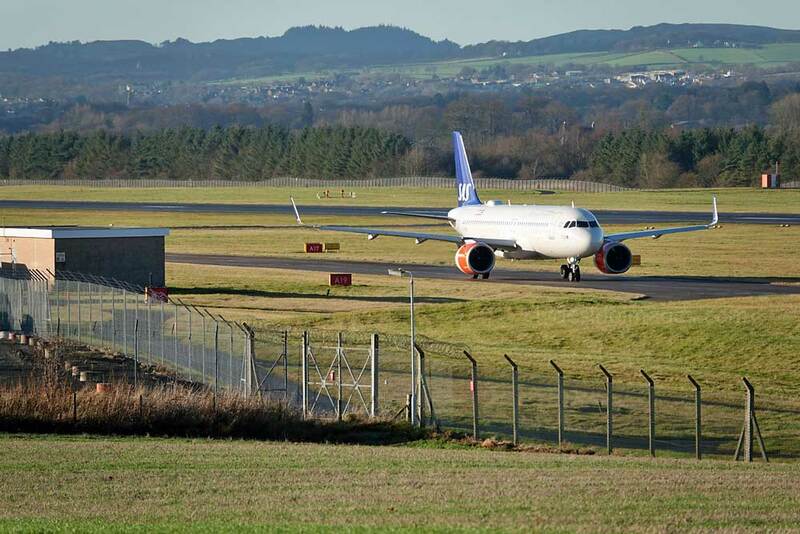 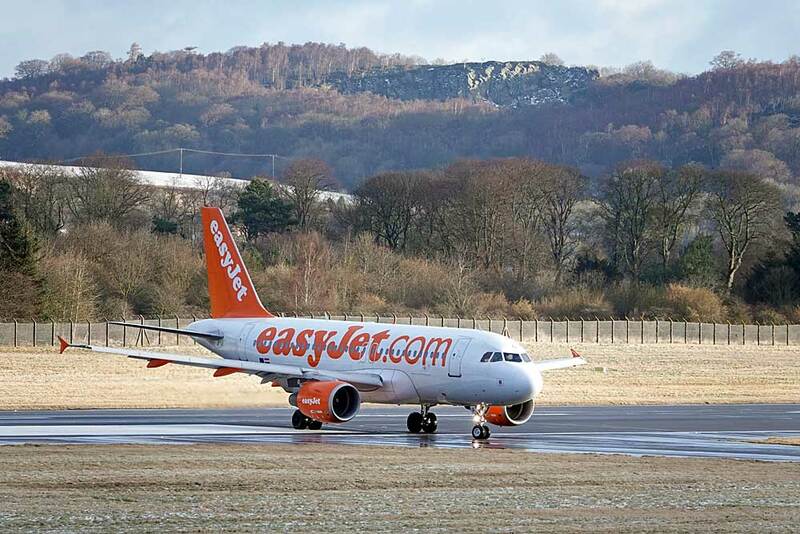 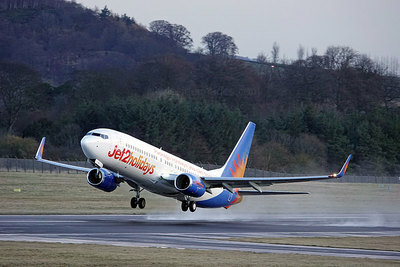 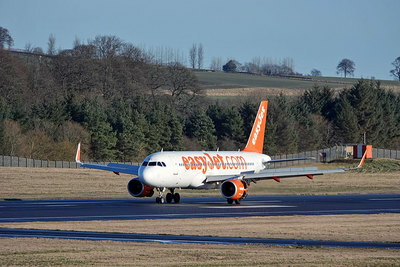 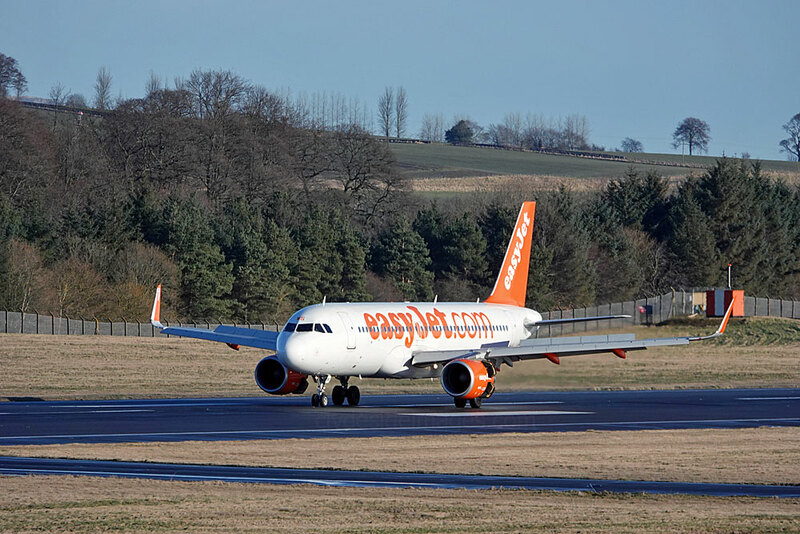 easyJet Airbus A319-111 G-EZPG vacates the runway after landing. 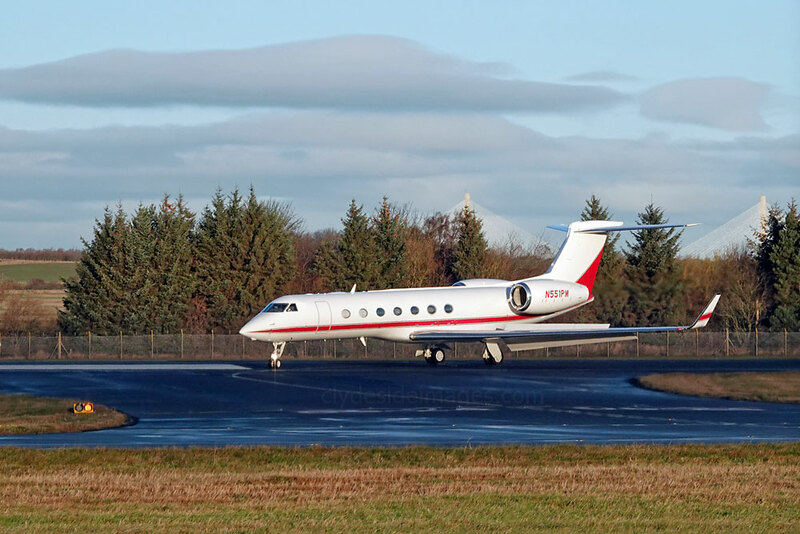 Just three corporate jets snapped this time round, namely US Gulfstream G550 N551PM, Embraer Phenom 300 D-CSCE, which had returned to the capital from Glasgow after overnight parking, and Austrian Citation Mustang OE-FZD. 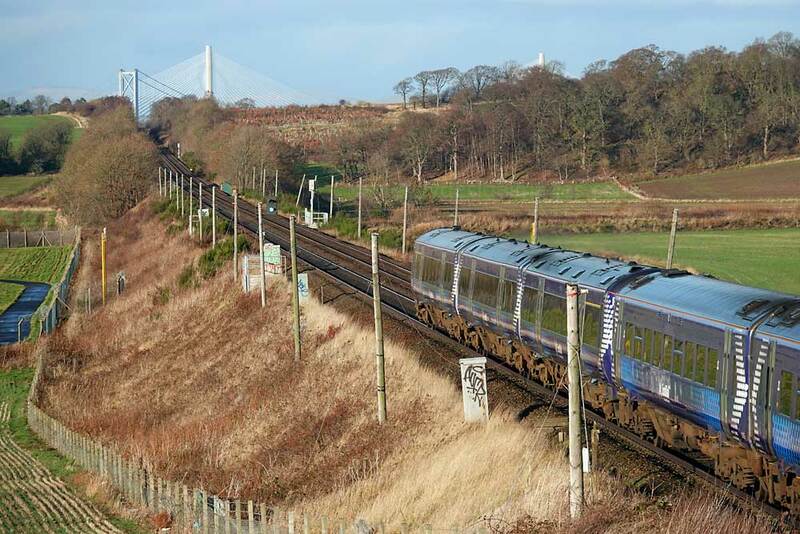 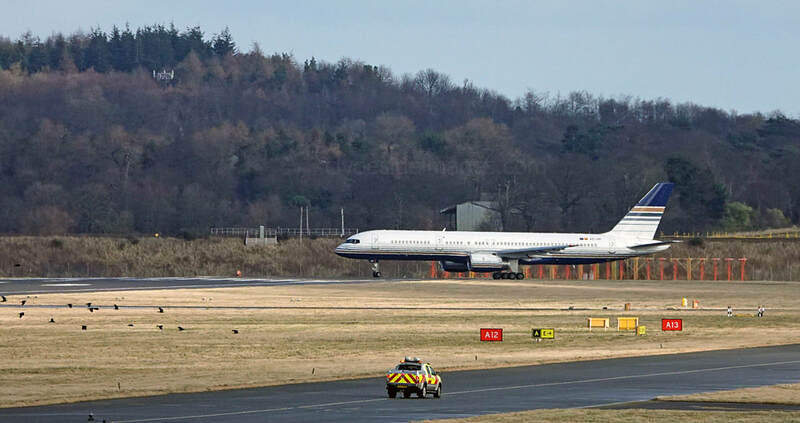 Any bi-annual international Scotland v France rugby match at Murrayfield attracts a large number of visiting French supporters, most of whom make their way to the city by air. 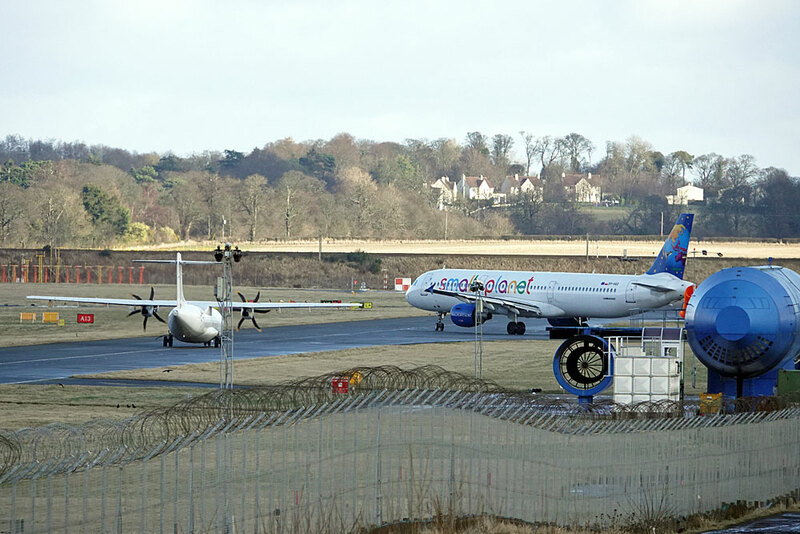 Having never been through to Edinburgh to catch these incoming charters and with the latest Six Nations encounter scheduled for Sunday 11 February, I decided to give it a go this year. The day immediately preceding match day is always the busiest, however, due to other commitments I couldn`t manage on the Saturday, settling for the Friday instead. 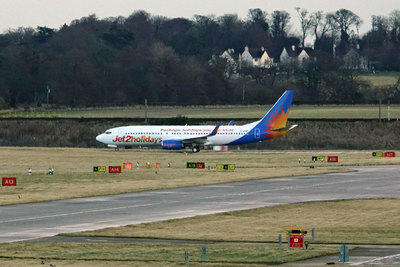 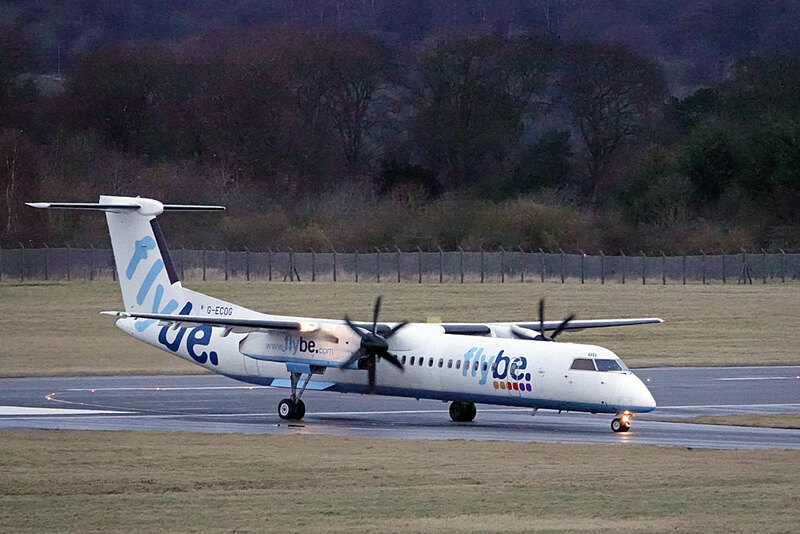 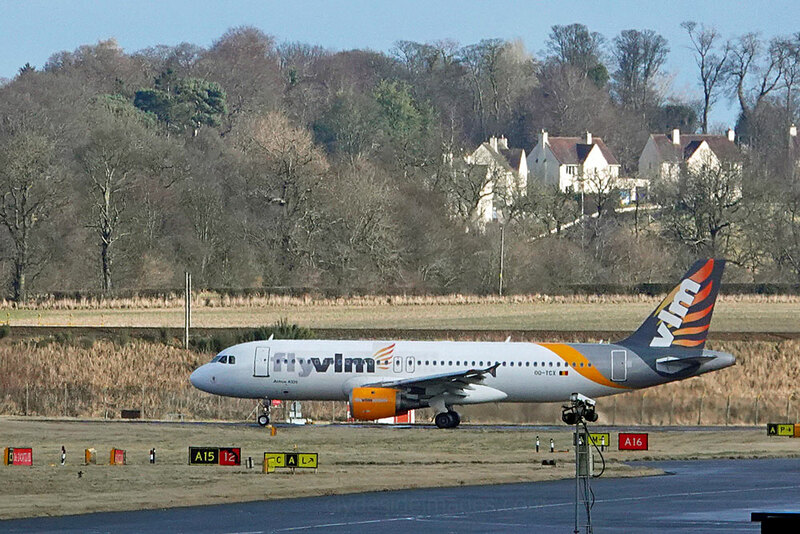 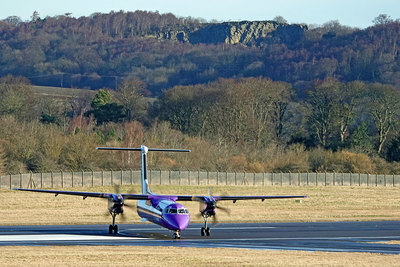 As it turned out there were only a couple of rugby-related arrivals but the weather was fine if a bit chilly and there were several interesting aircraft which I wouldn`t have seen at Glasgow. 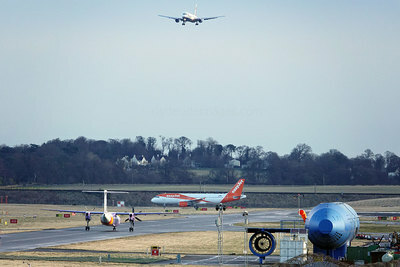 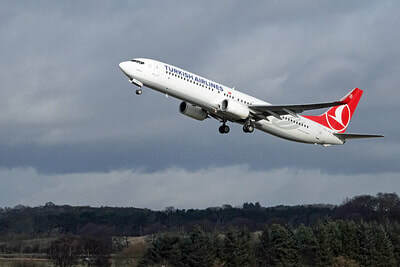 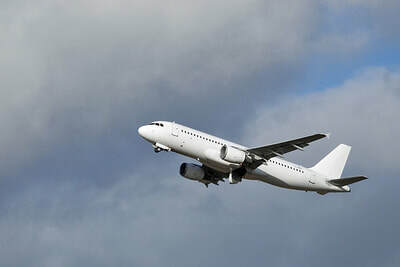 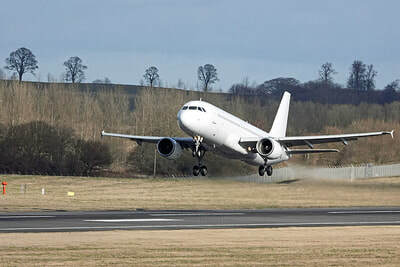 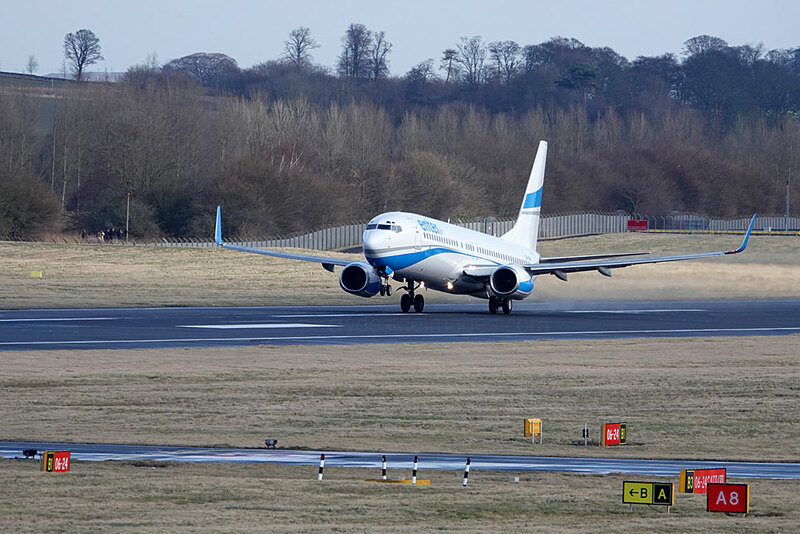 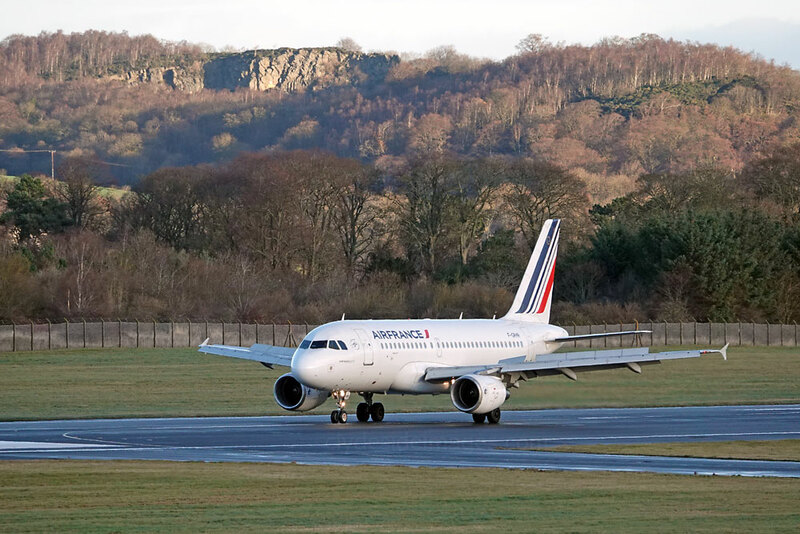 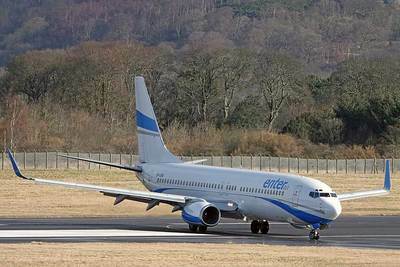 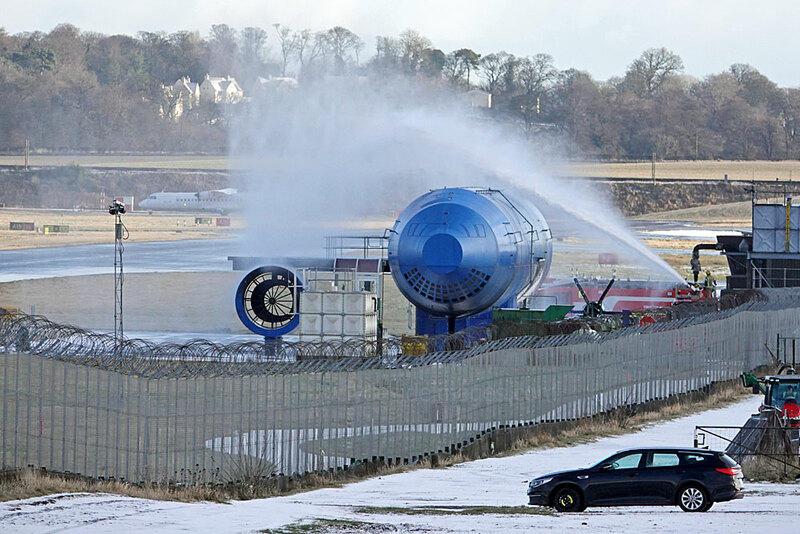 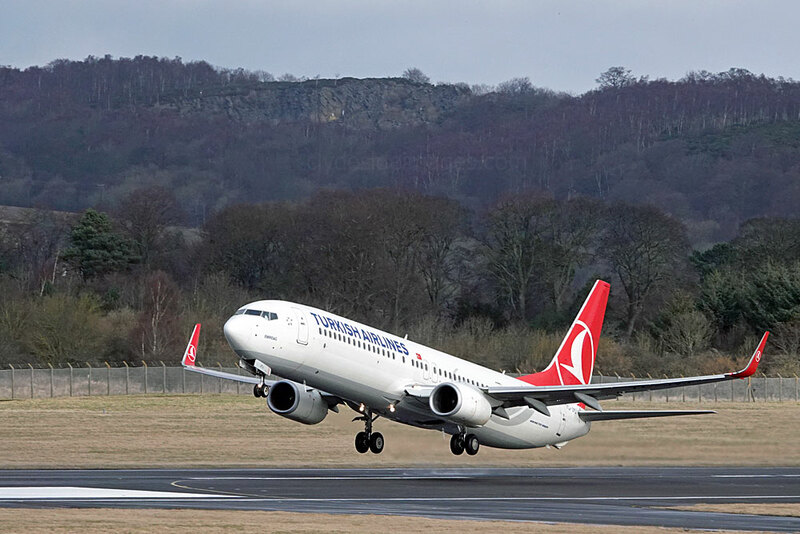 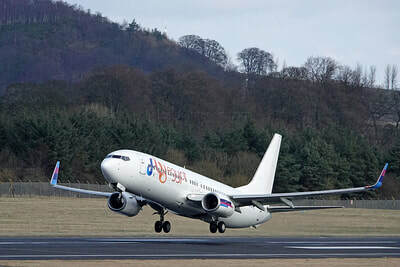 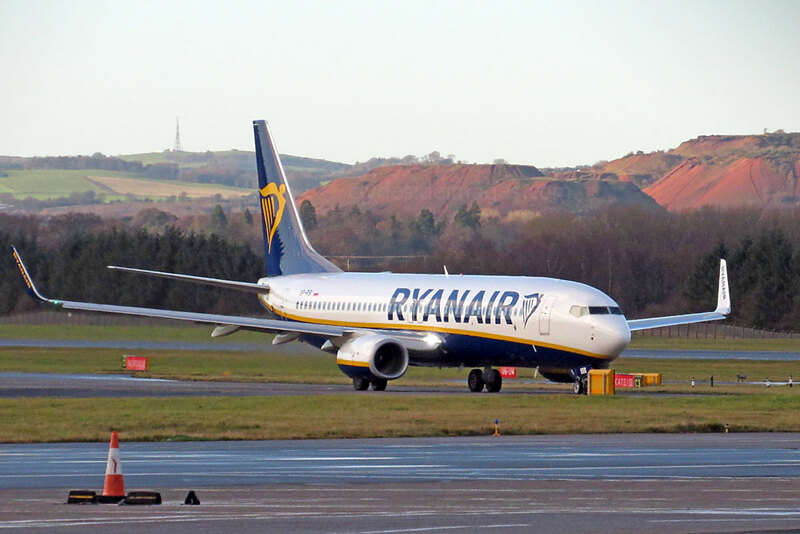 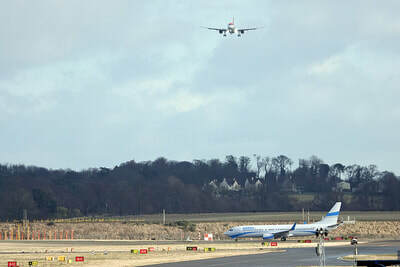 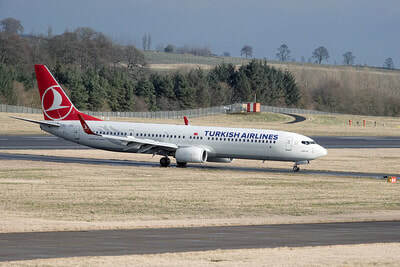 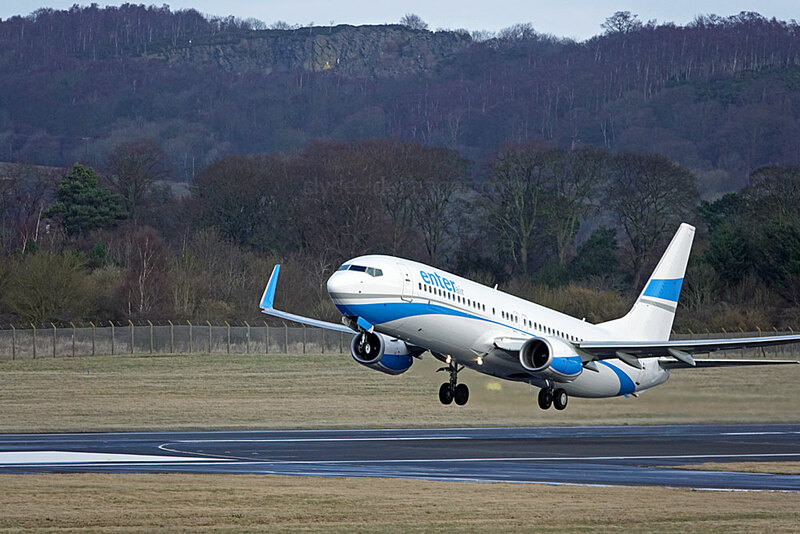 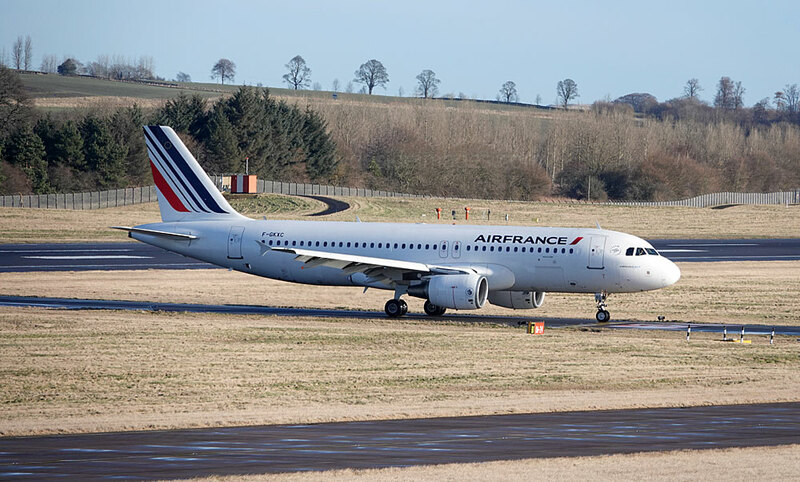 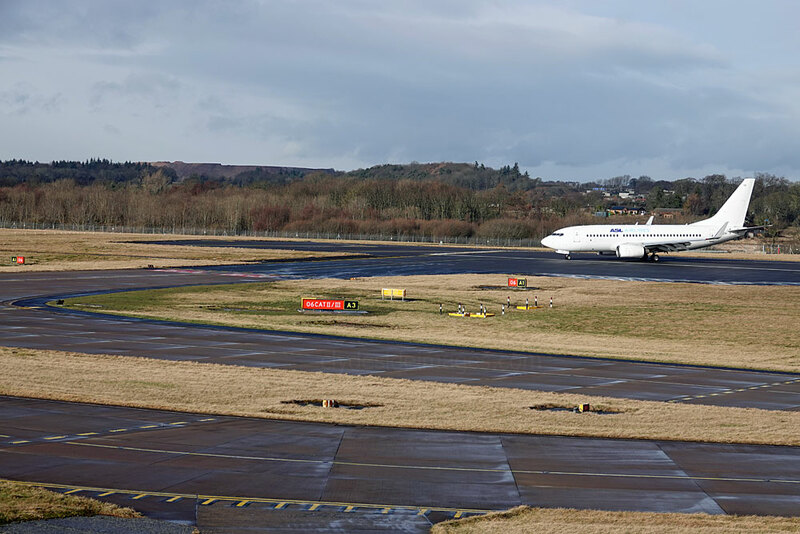 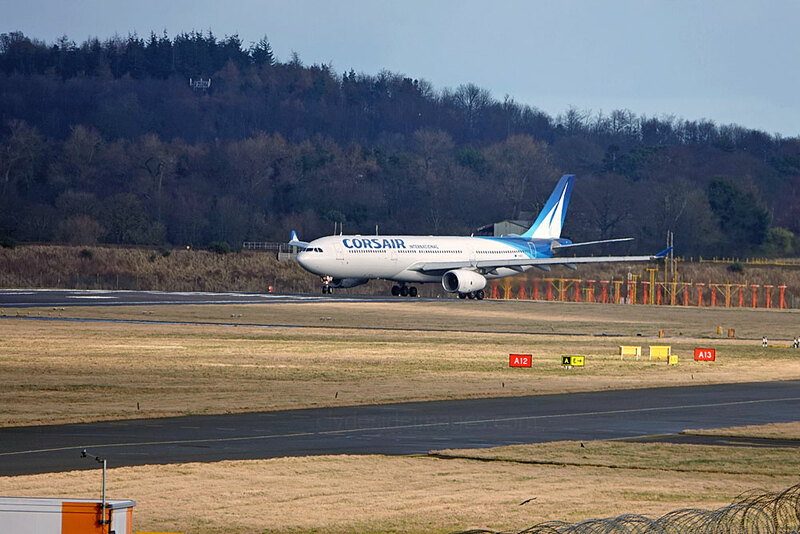 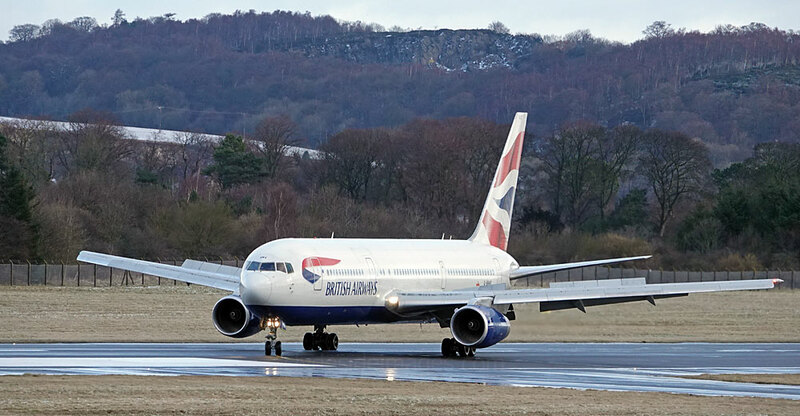 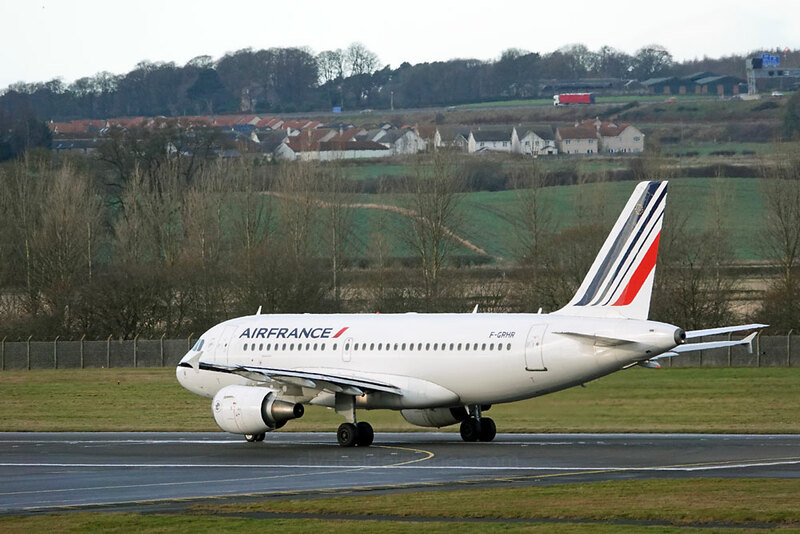 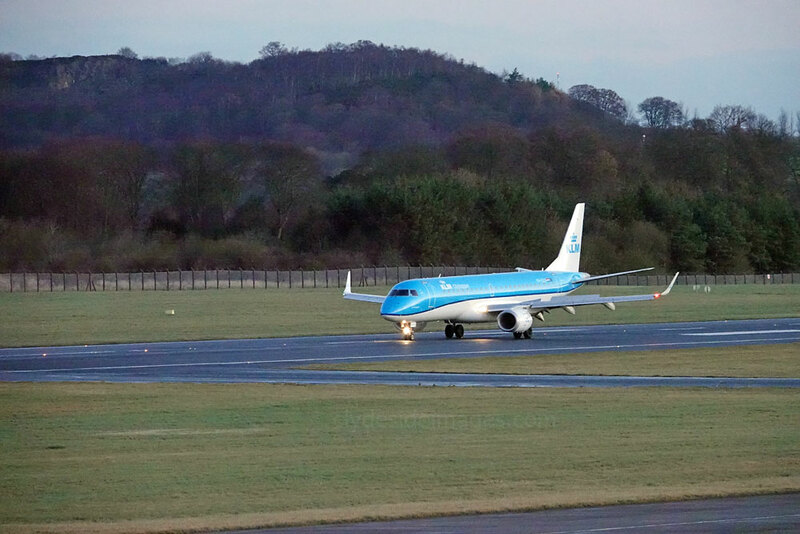 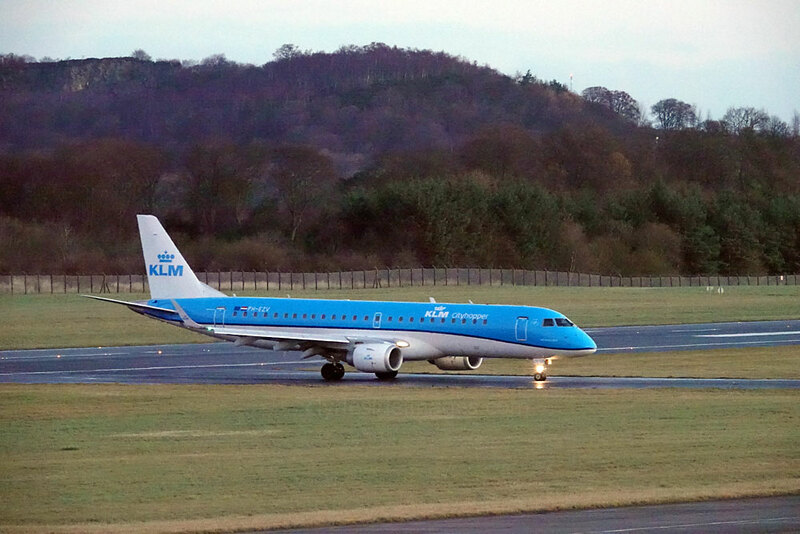 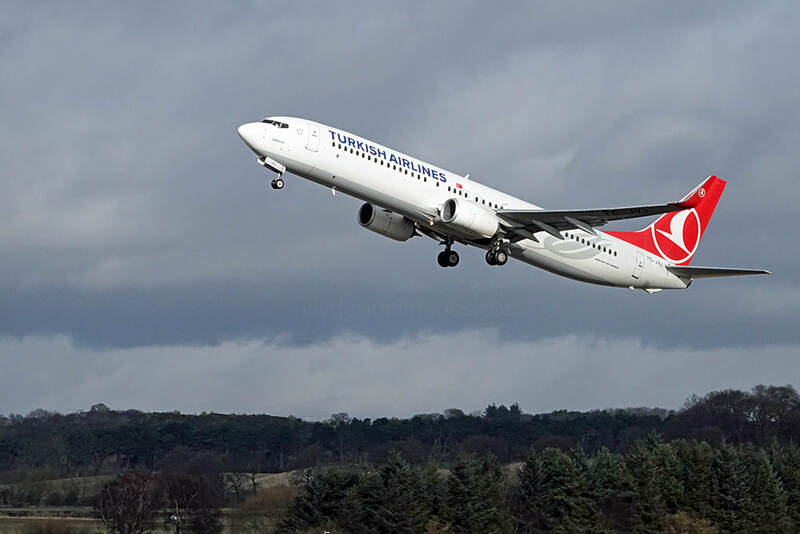 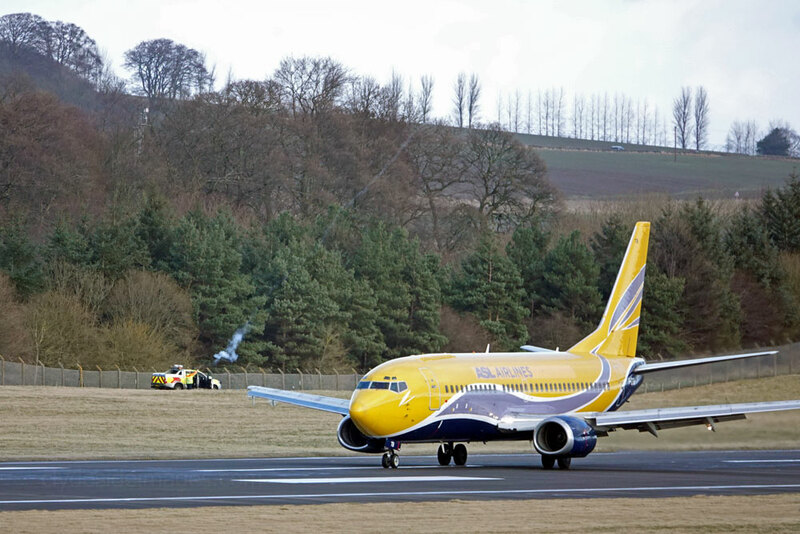 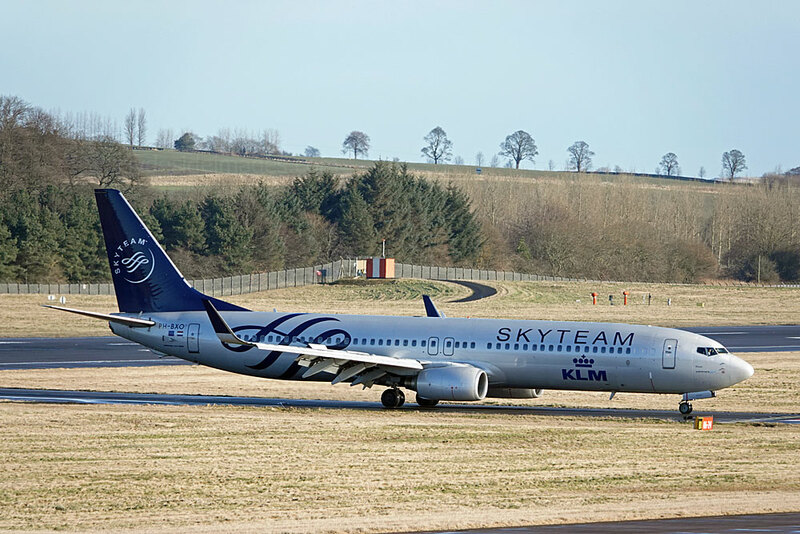 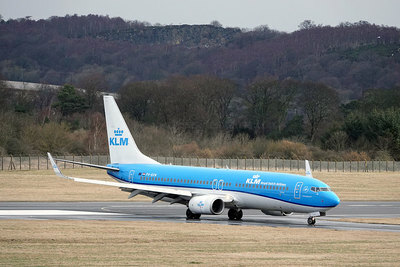 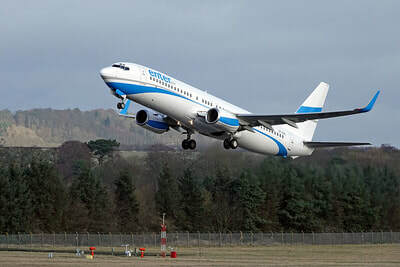 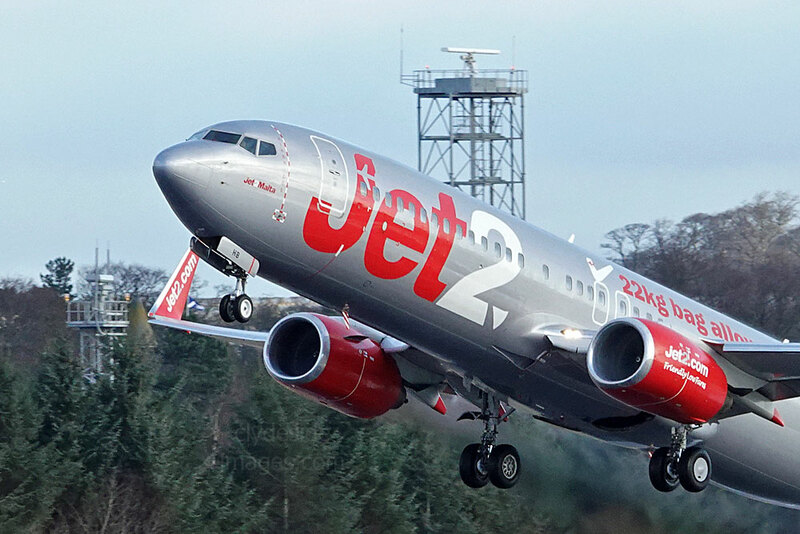 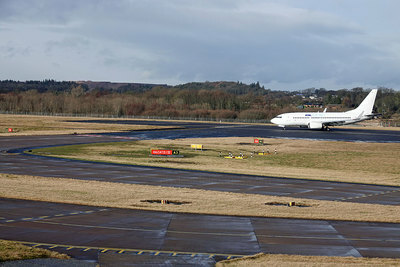 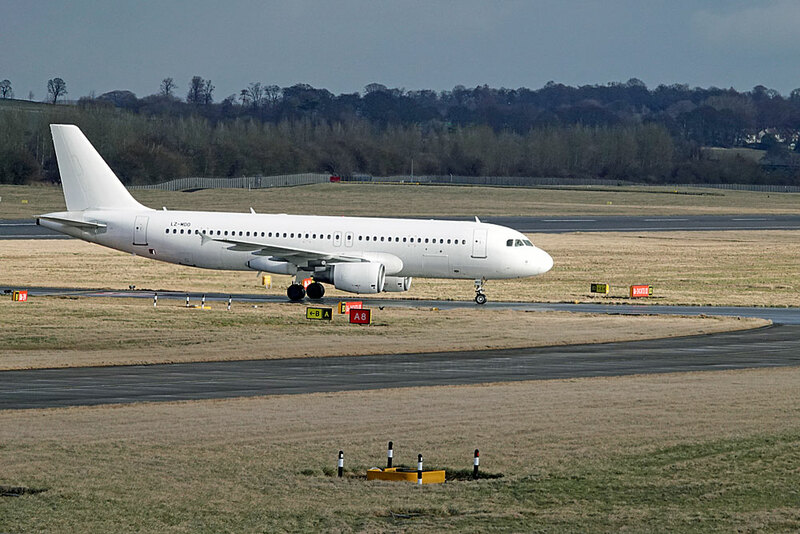 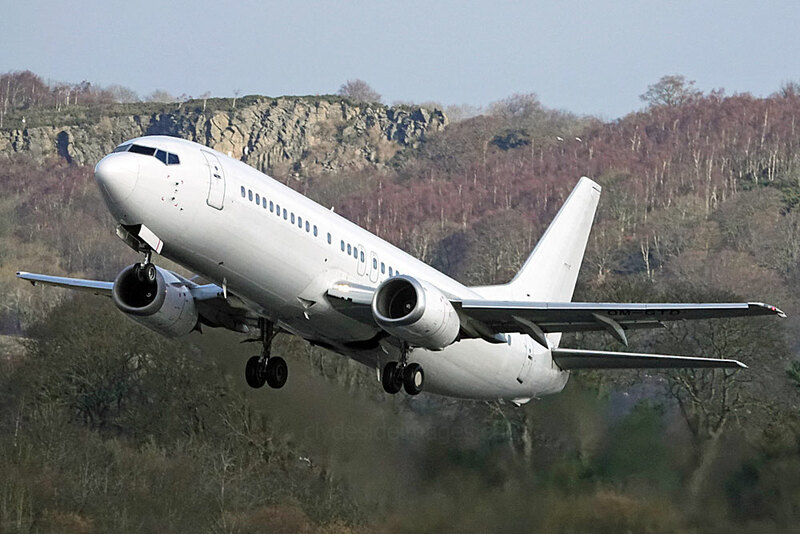 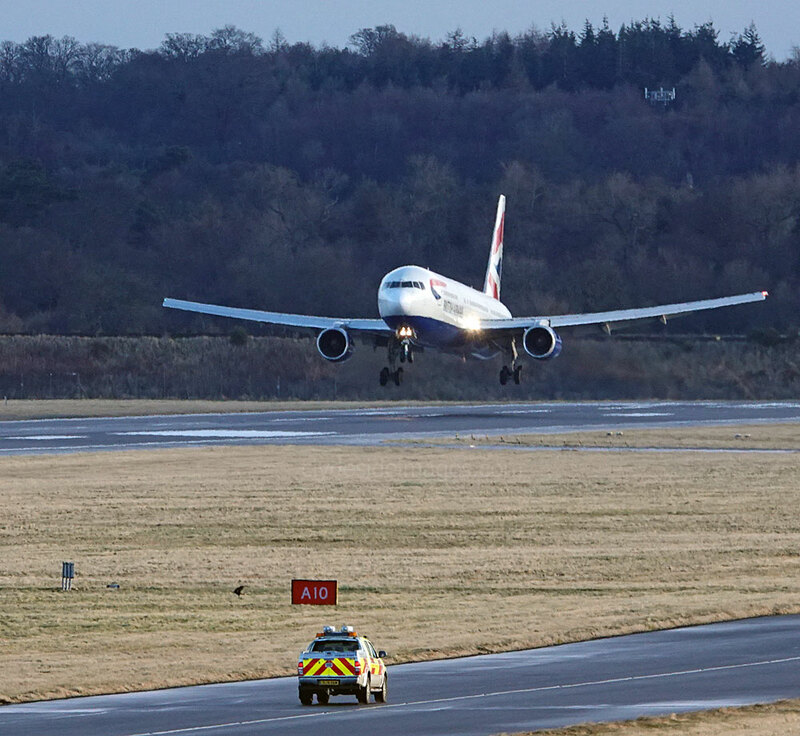 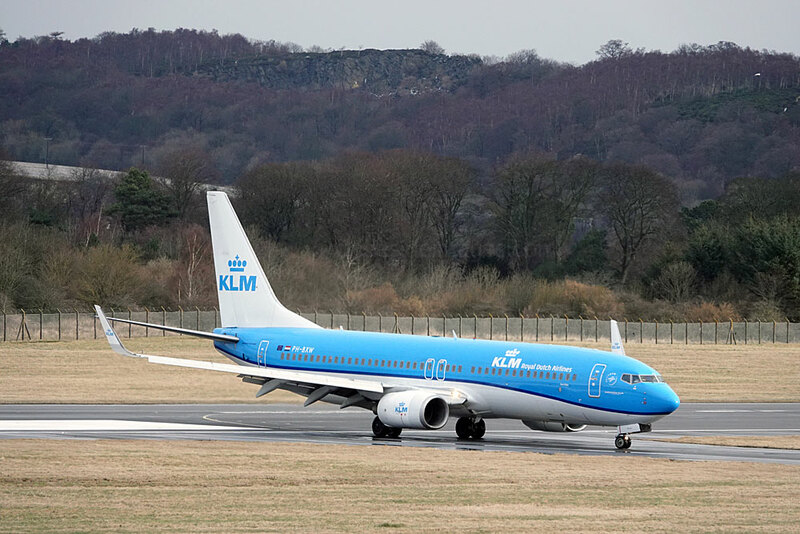 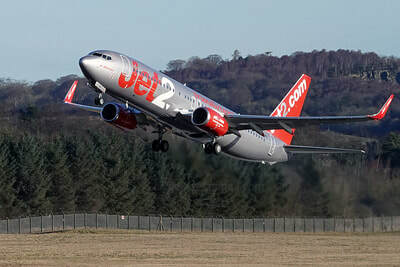 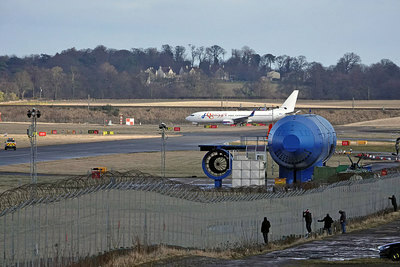 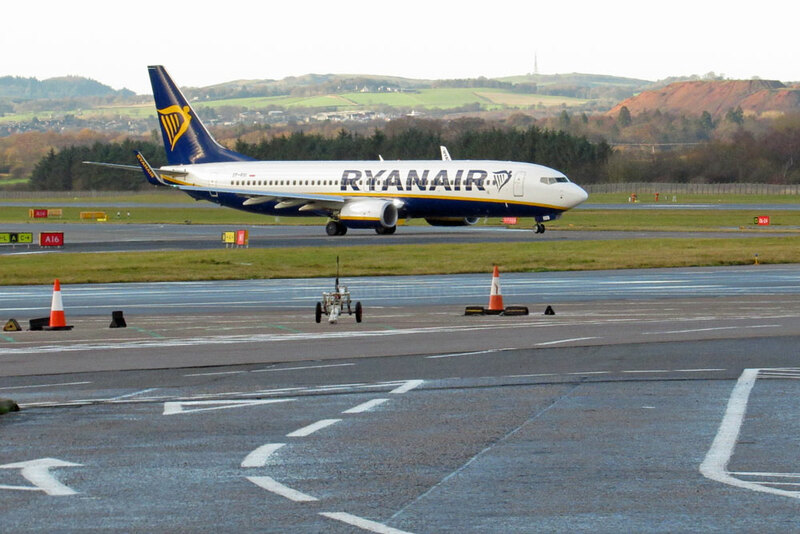 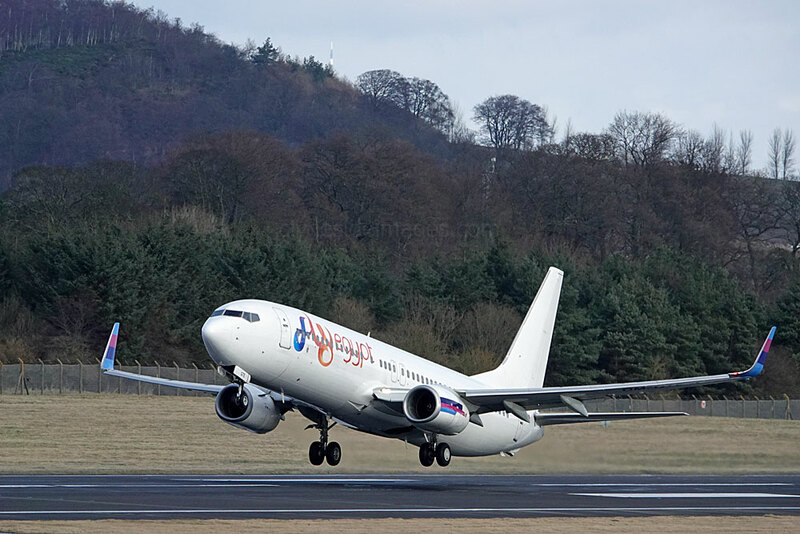 Fortunately for those enthusiasts, like me, who missed arrivals day, most of the airliners stayed over until the Monday morning to allow the French fans to celebrate or, as it turned out on this occasion, to drown their sorrows in the Scottish Capital`s bars, restaurants and clubs. 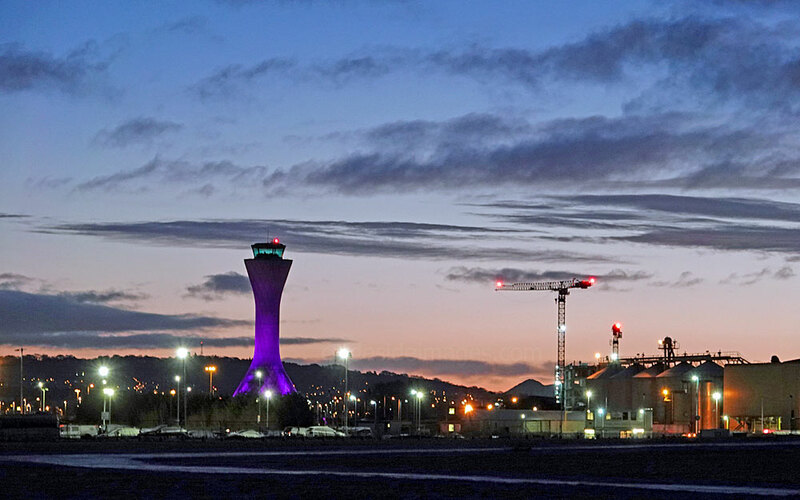 Following a hefty defeat by Wales in their first match, Scotland came from behind to beat France 32-26 with Greig Laidlaw, who was just back after a year-long layoff due to injury, taking centre stage by contributing massively towards the victory with six penalties. 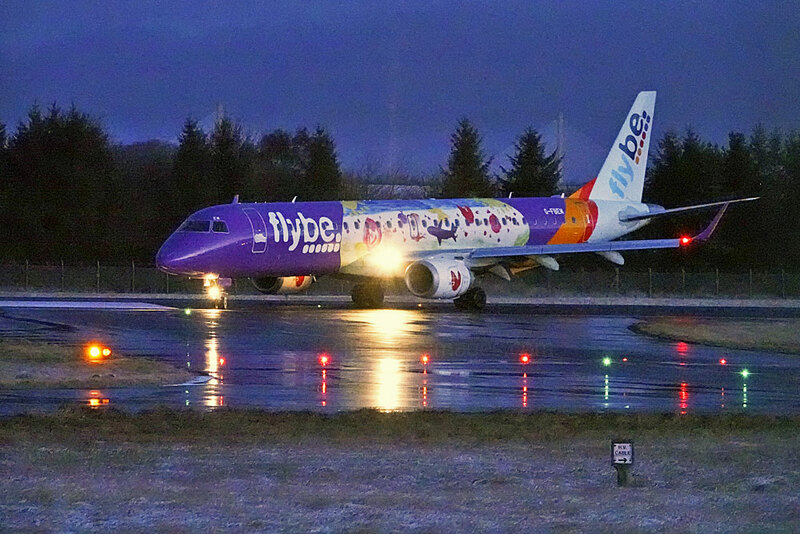 I drove through early to miss the morning M8 rush-hour traffic and got to the airport just before first light. 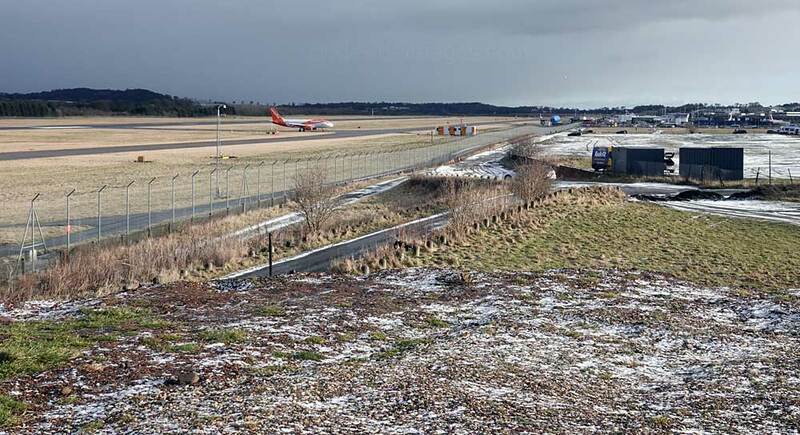 Although there wasn`t as much lying snow as on the west coast the large car park used as the main viewing area was well covered when I arrived, however, by midday it had almost completely thawed. 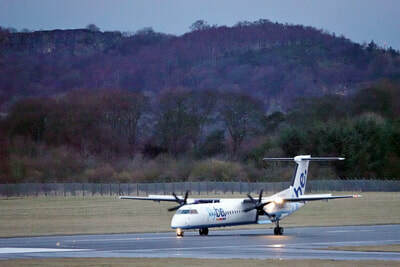 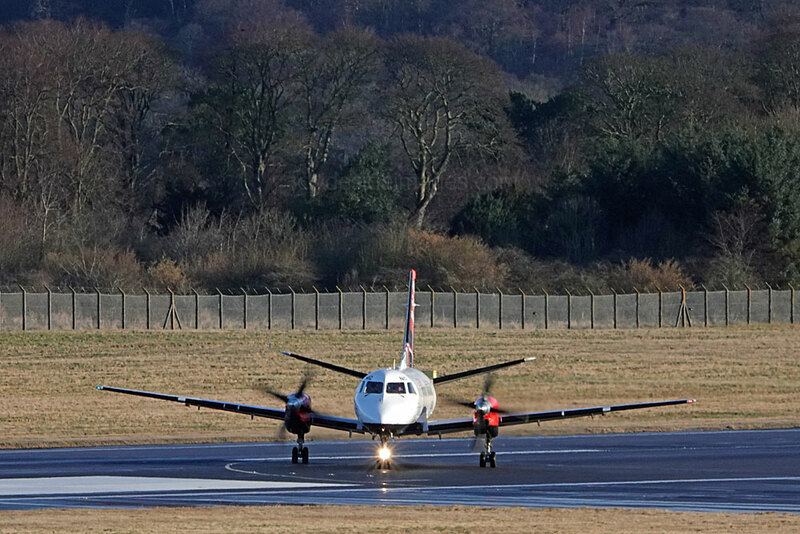 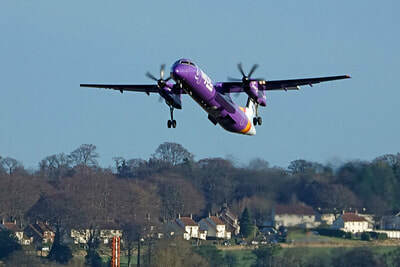 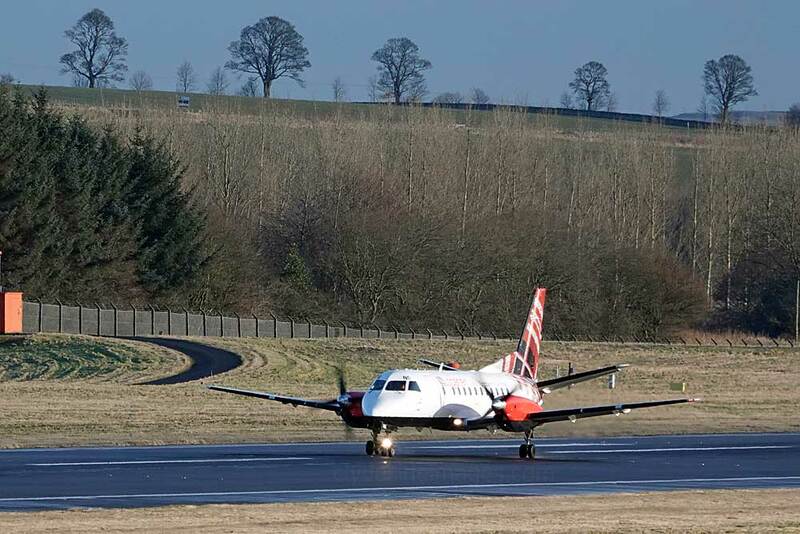 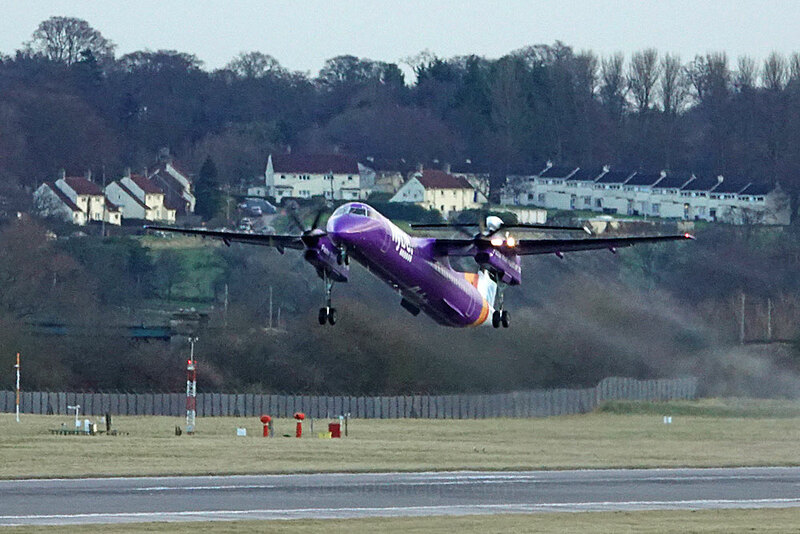 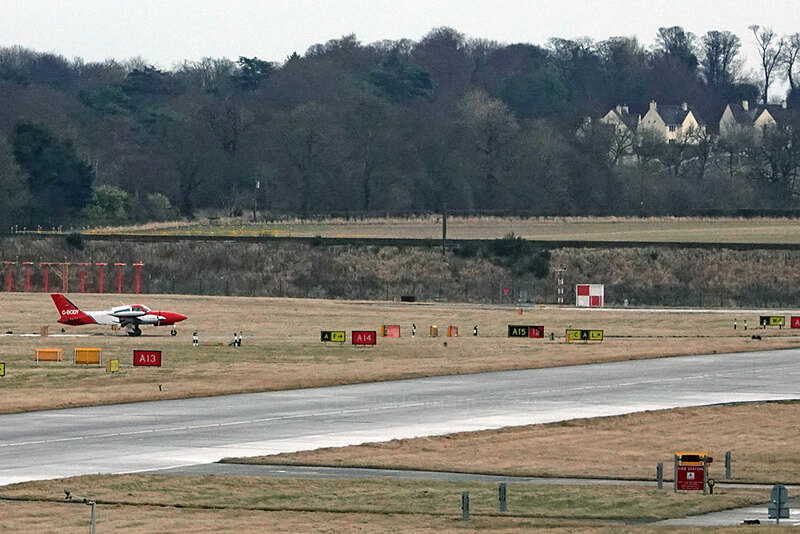 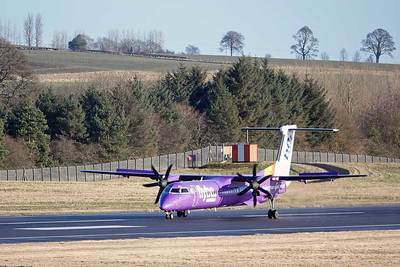 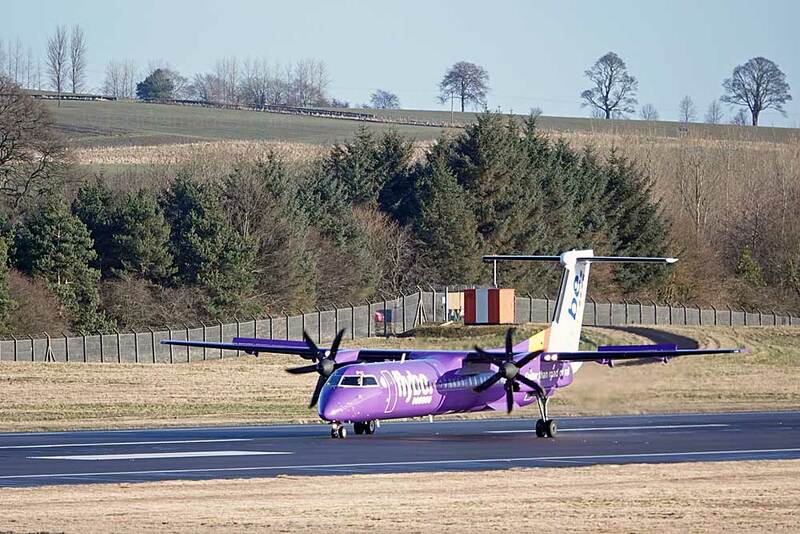 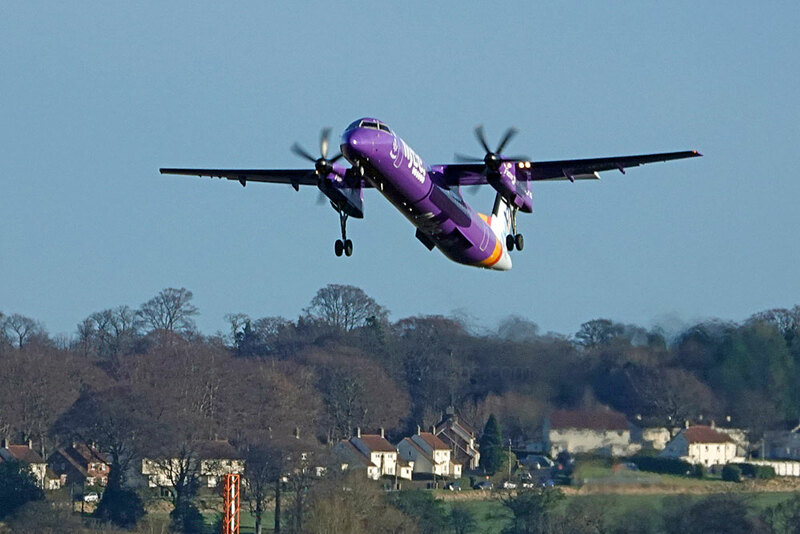 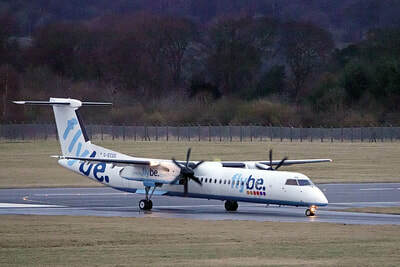 RAF-Avia Saab 340B YL-RAF was the first of the rugby charter aircraft to leave on Monday morning, lifting off at 08:25 hrs. 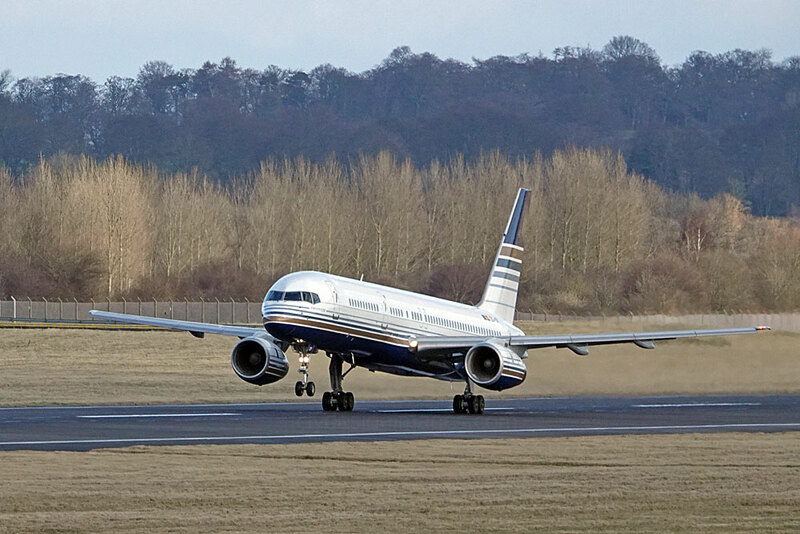 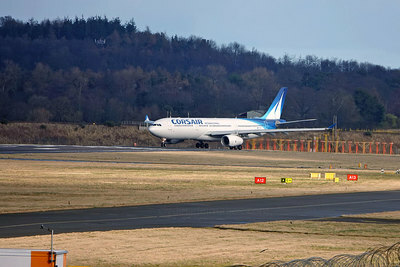 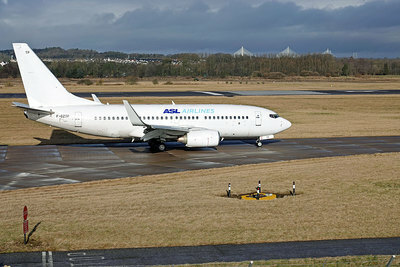 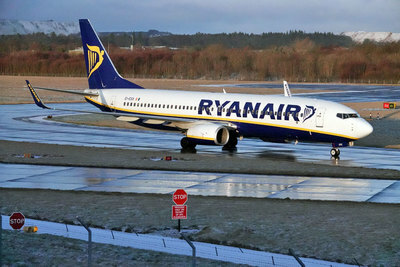 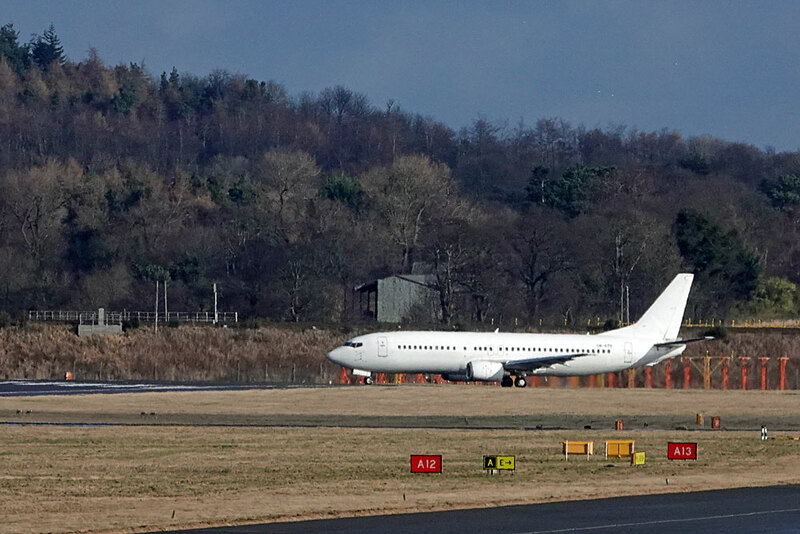 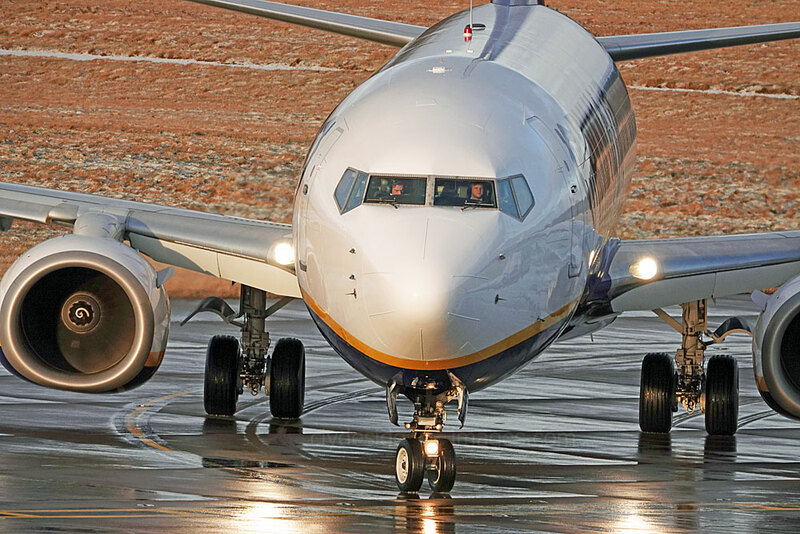 Privelage Style Boeing 757-256 EC-ISY about to line-up for take-off. 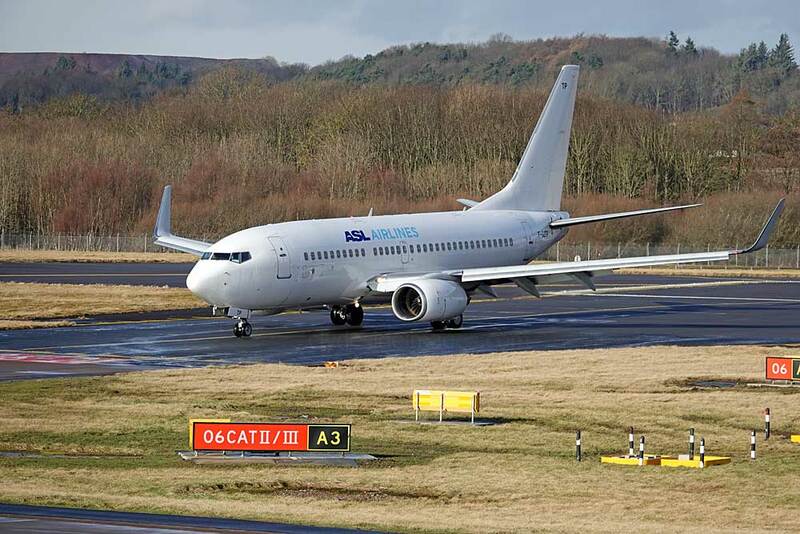 Go2Sky Boeing 737-46J OM-GTD starts rolling. 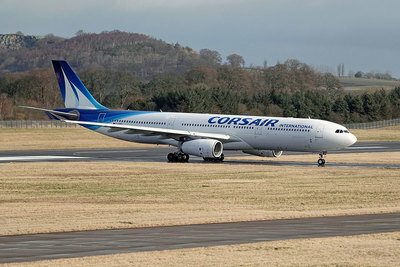 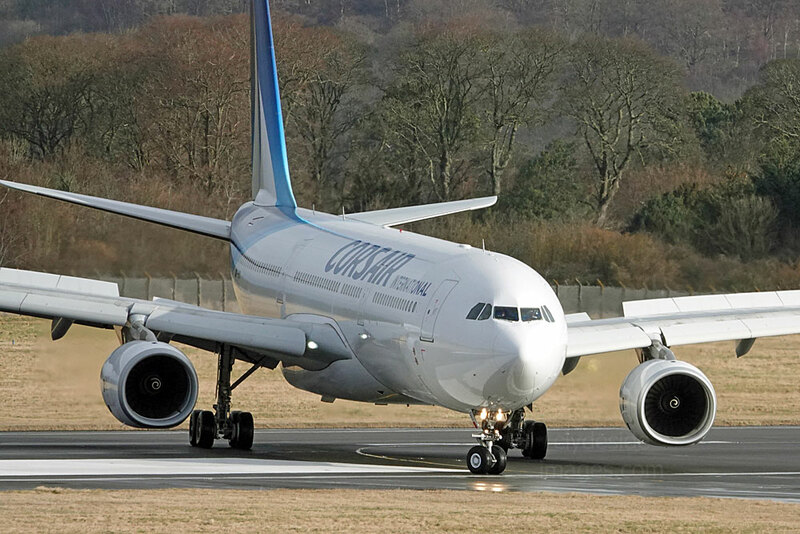 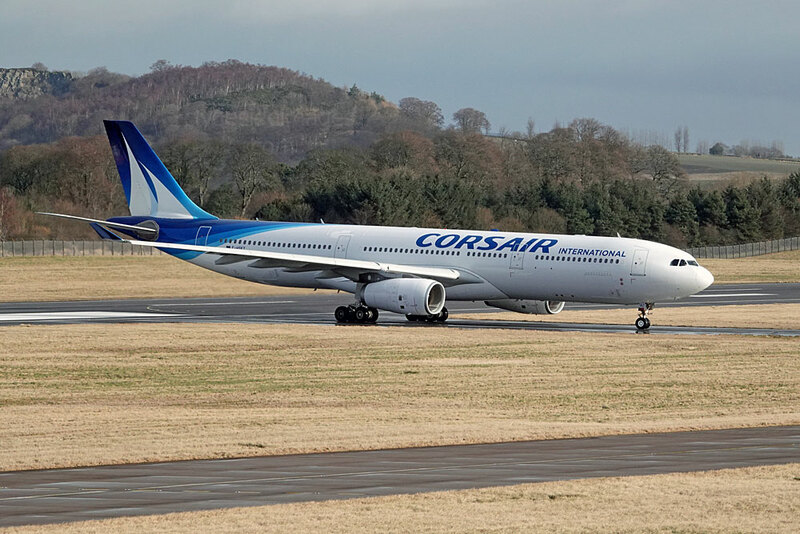 Corsair Airbus A330-343 F-HSKY lifts-off from Runway 24. 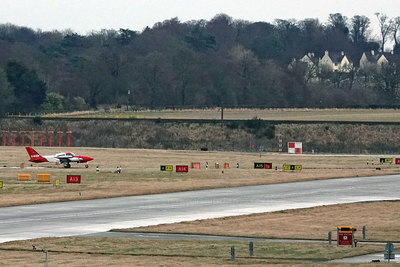 There was a bitterly cold wind blowing therefore I decided to drive onto the mound and sit in the car. 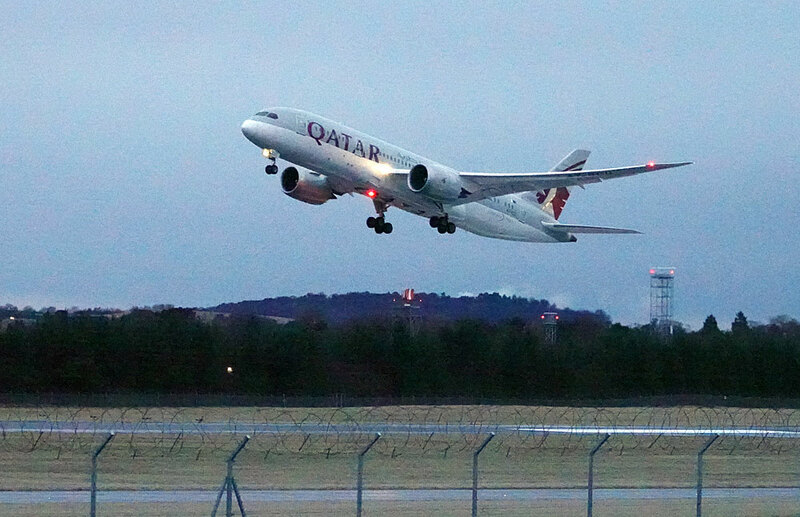 ​Qatar Airways Boeing 787-8 Dreamliner A7-BCX, A330-243 A6-EYG of Etihad Airways and United Boeing 757 N21108 were the only aircraft in this category. 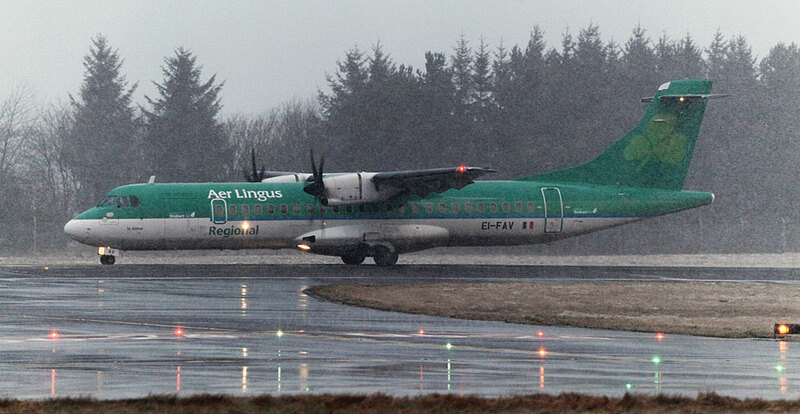 It clouded over just after dawn bringing a flurry of snow but visibility quickly improved. 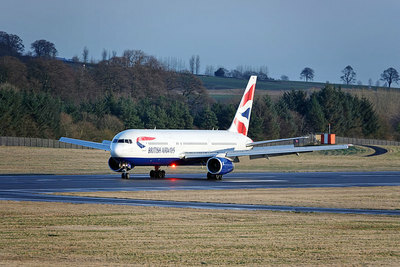 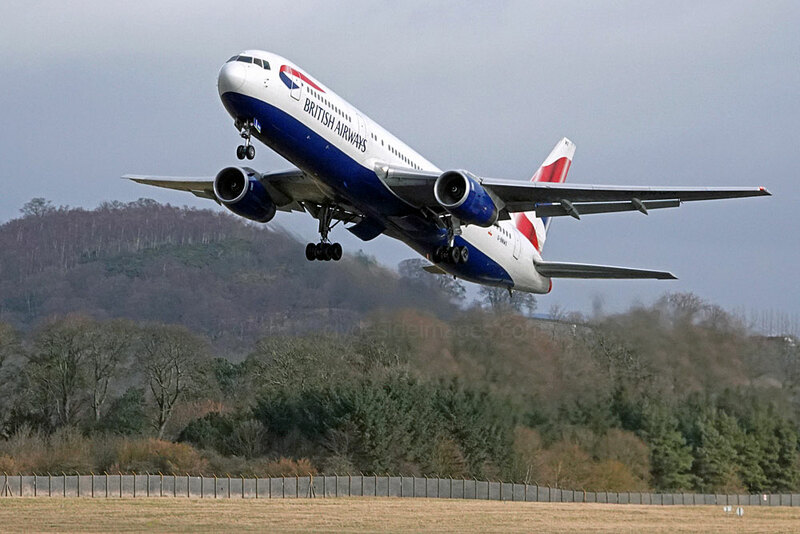 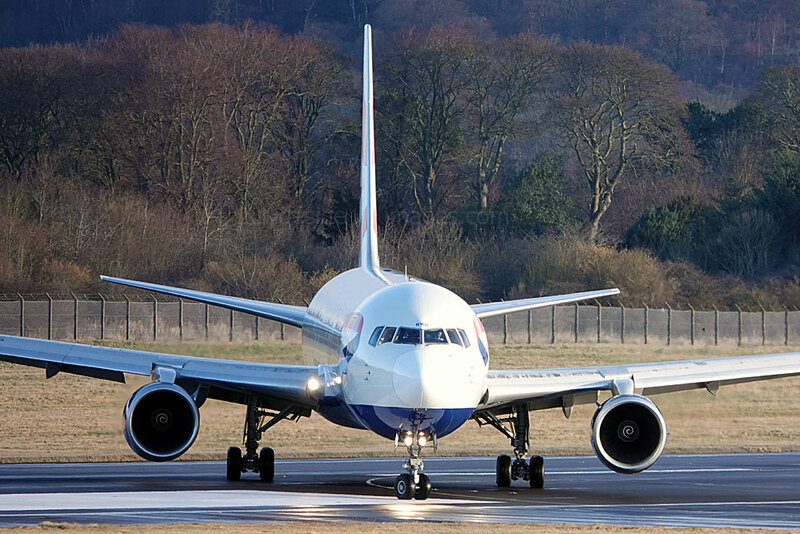 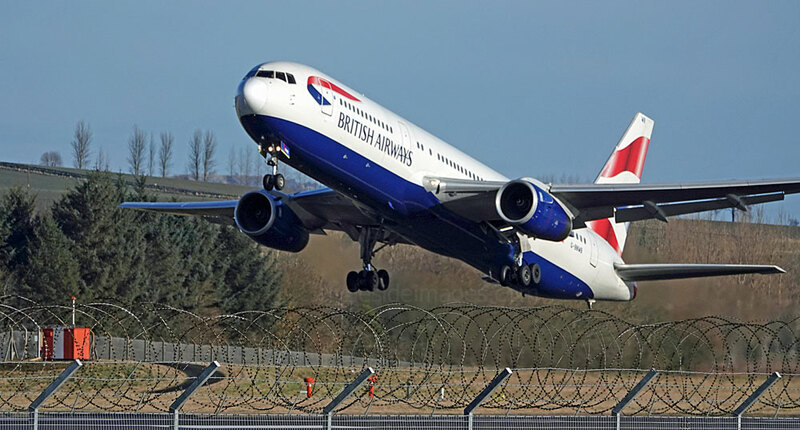 BA Boeing 767-336(ER) G-BNWX takes-off for London Heathrow. 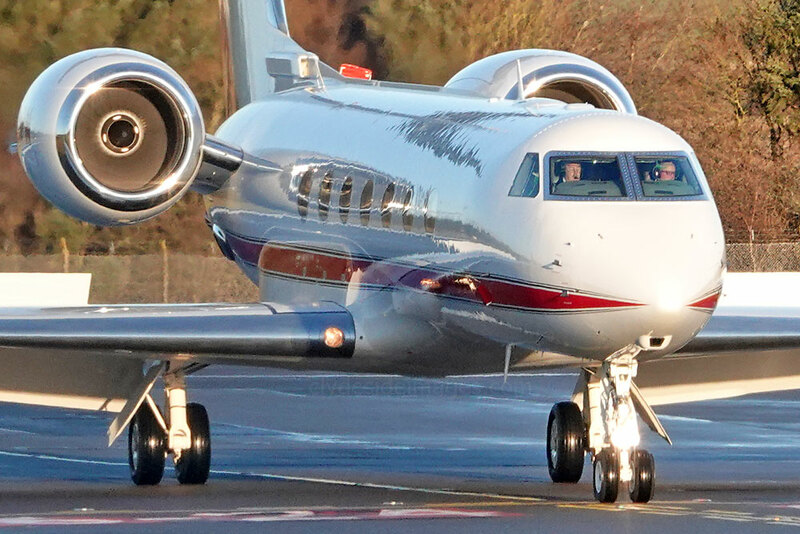 LearJet 45XR LX-LAR is one of 5 air ambulances owned and operated by Luxembourg Air Ambulance and under the exclusive coordination of European Air Ambulance. All aircraft are fitted with state-of-the-art medical equipment and necessary medication to serve as flying intensive care units for medical repatriation worldwide. 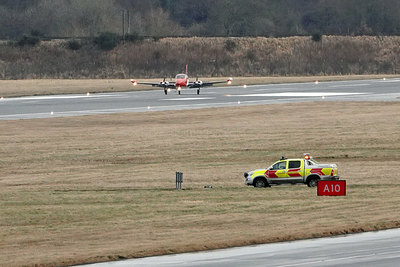 More information can be found on the official website: www.air-ambulance.com. 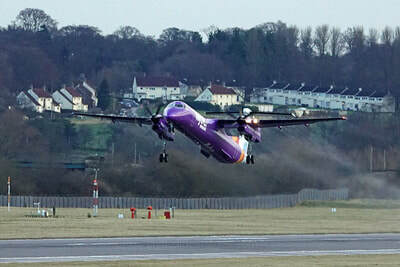 RAF-Avia Saab 340B YL-RAF. 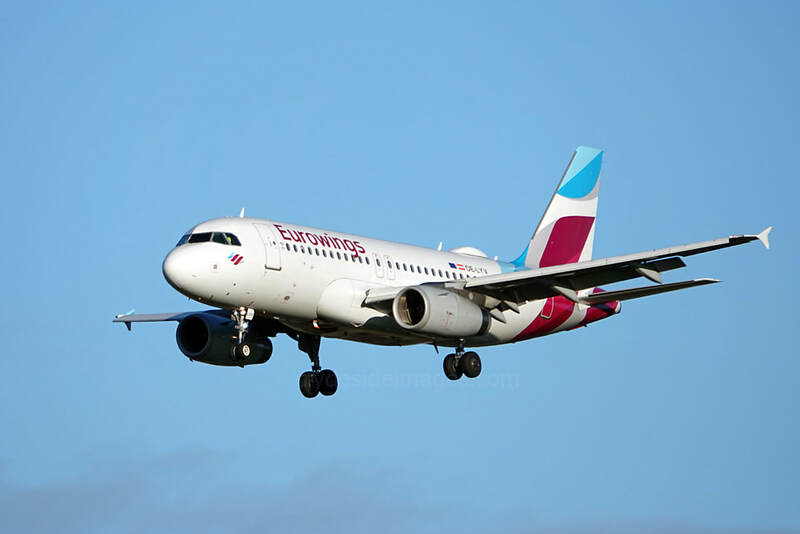 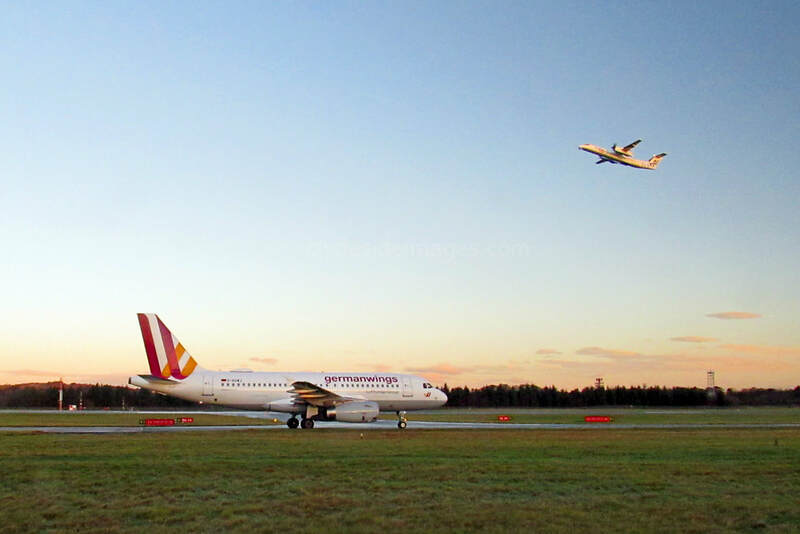 ​This Latvian operator is based at Riga International Airport and when it was established in 1990 it became the country`s first private airline. Its first contract was to fly spare parts and other supplies for the Riga Autobus Factory (RAF) in Jelgava which produced vans and minibuses. 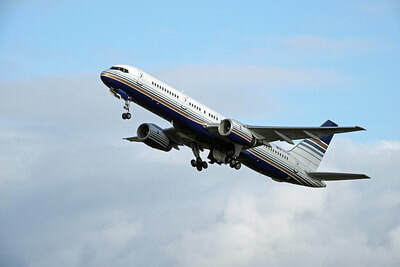 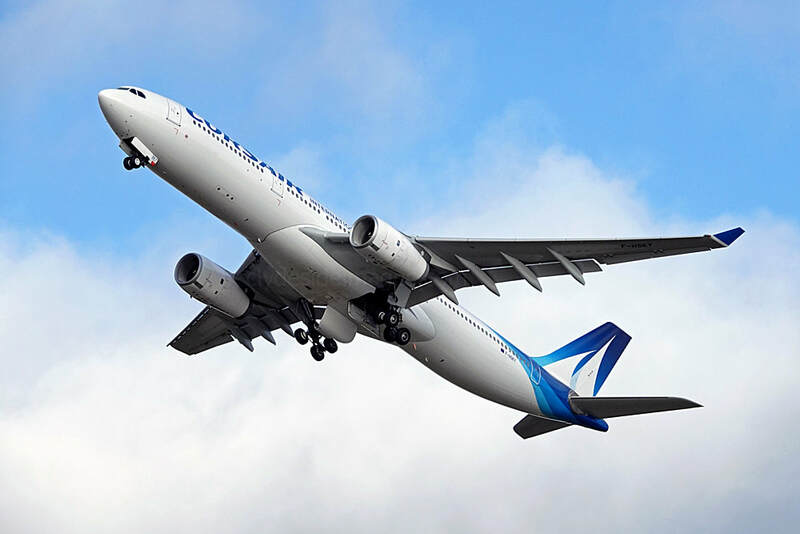 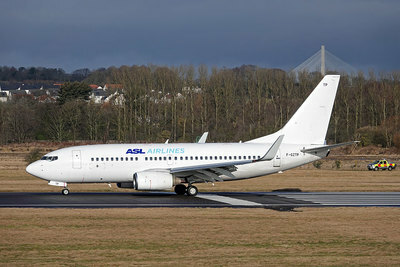 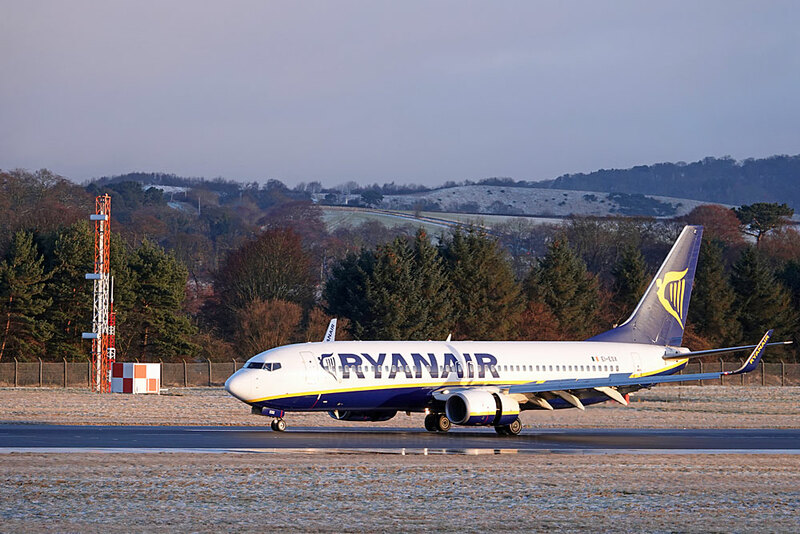 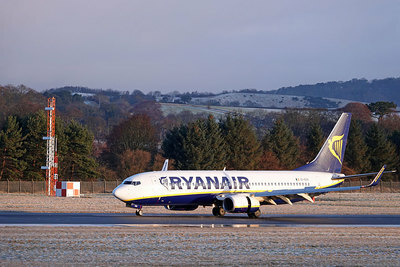 In 1994 RAF-Avia began to switch to the commercial charter flight business and two years later it became a privately owned joint stock company. 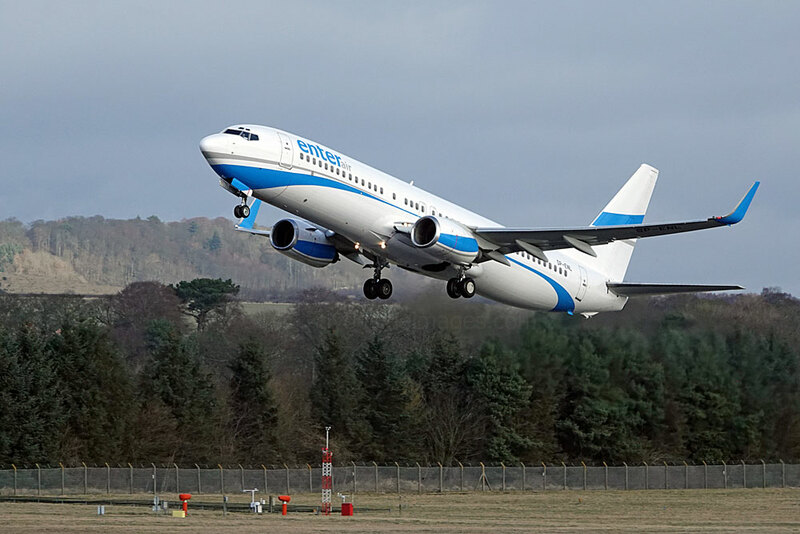 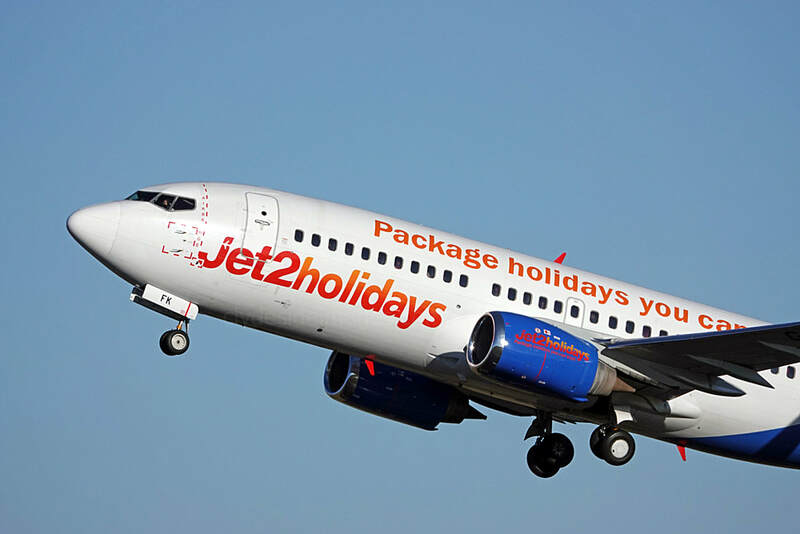 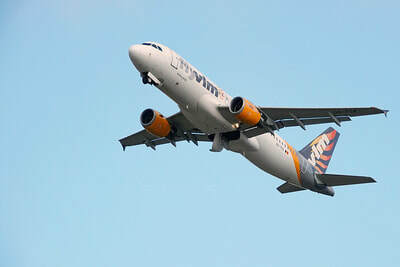 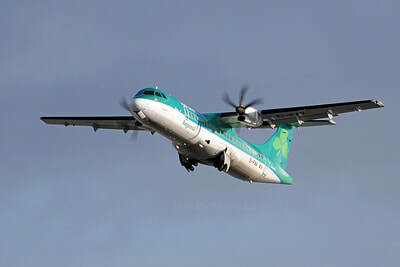 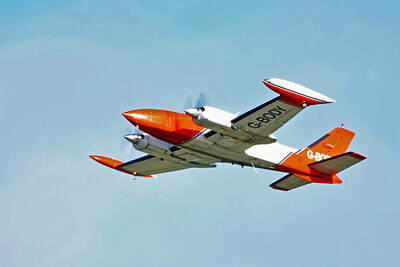 It is now wholly owned by the RAF-Avia Group. 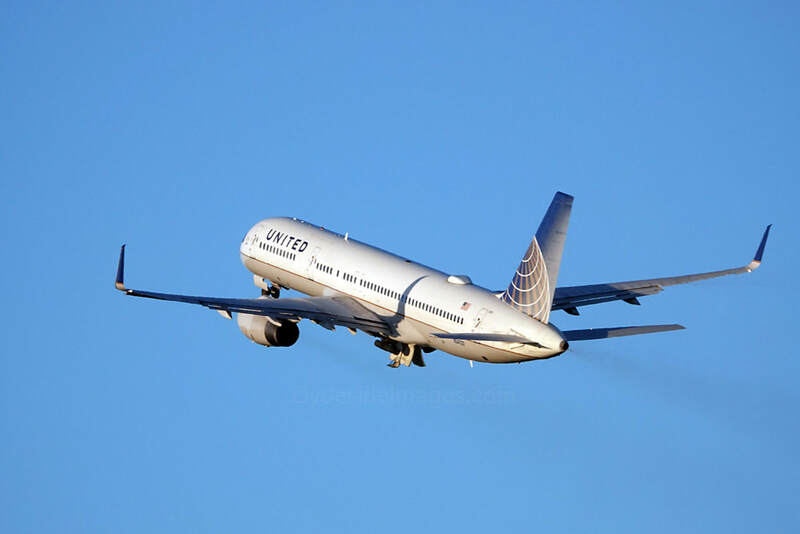 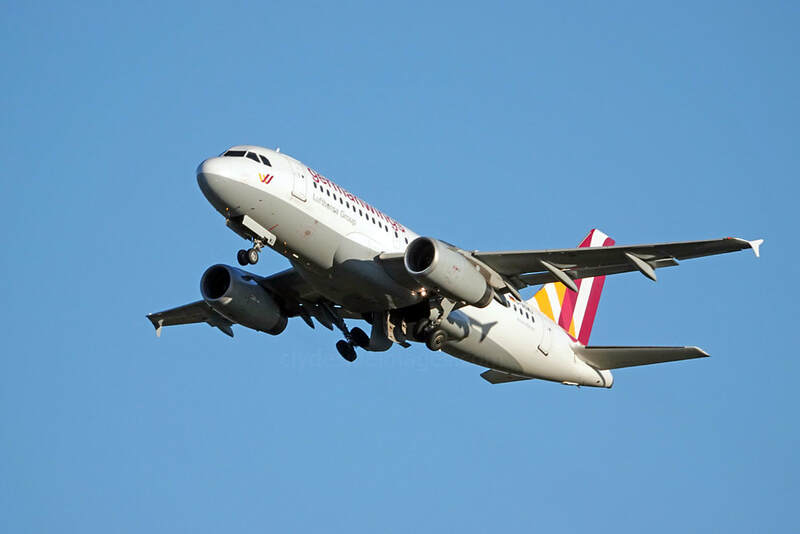 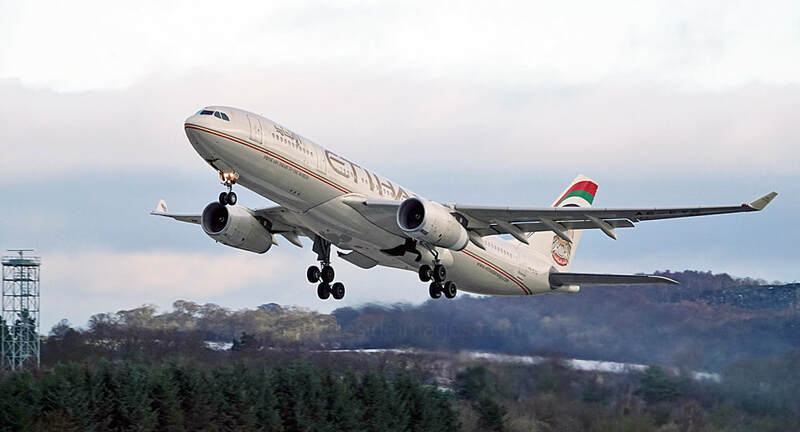 The carrier currently operates cargo services for TNT, DHL and others, as well as transport for the military, the United Nations (UN) and passenger charters. 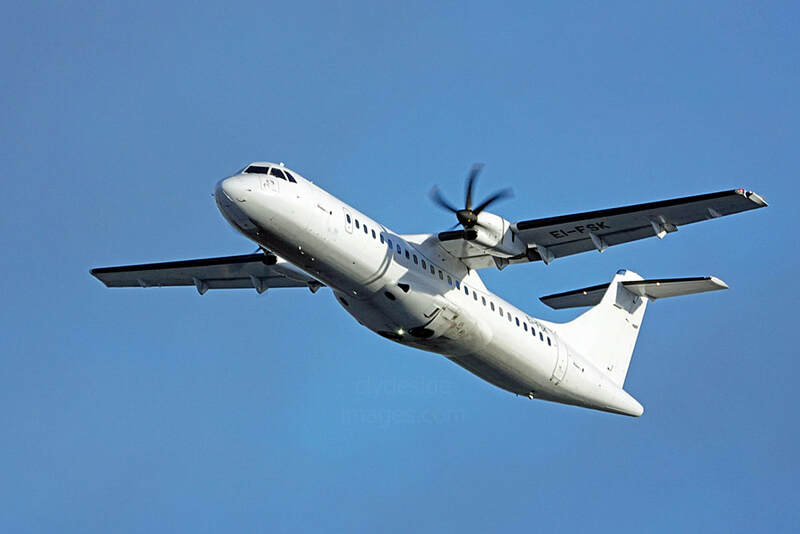 As of August 2017 the fleet consists of four Antonov An-26, one ATR 72-200F, a pair of Saab 340AFs and two Saab 340Bs. 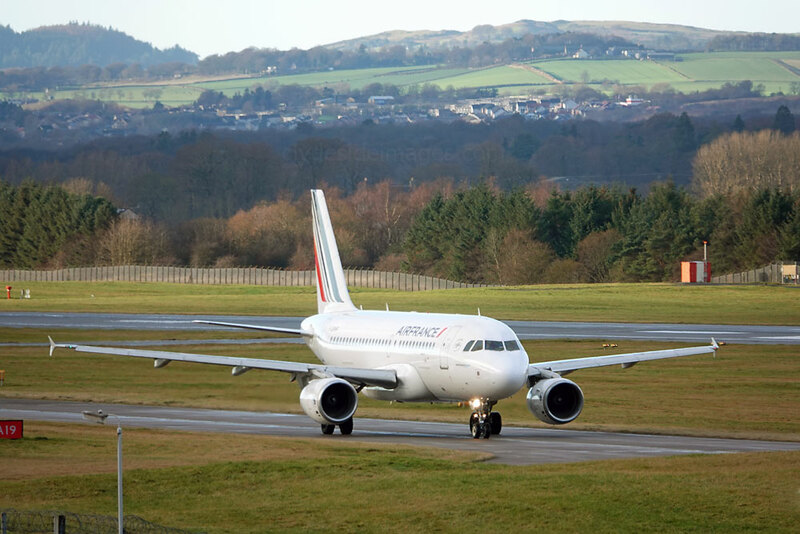 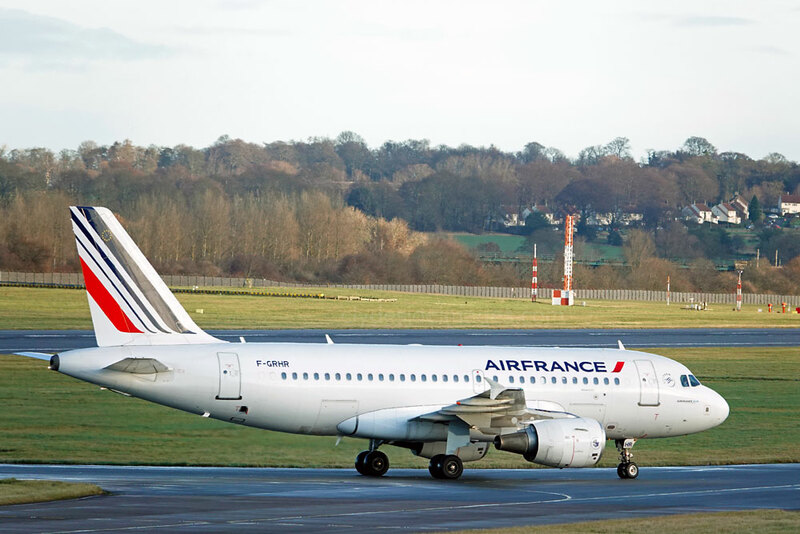 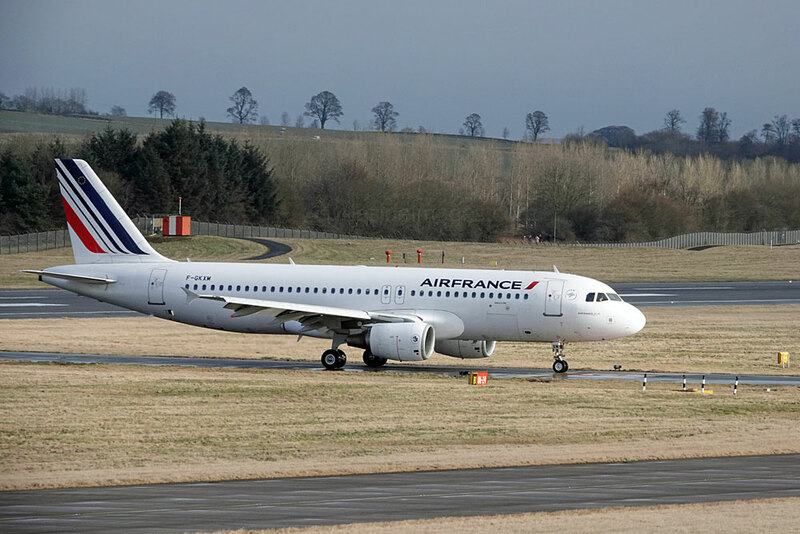 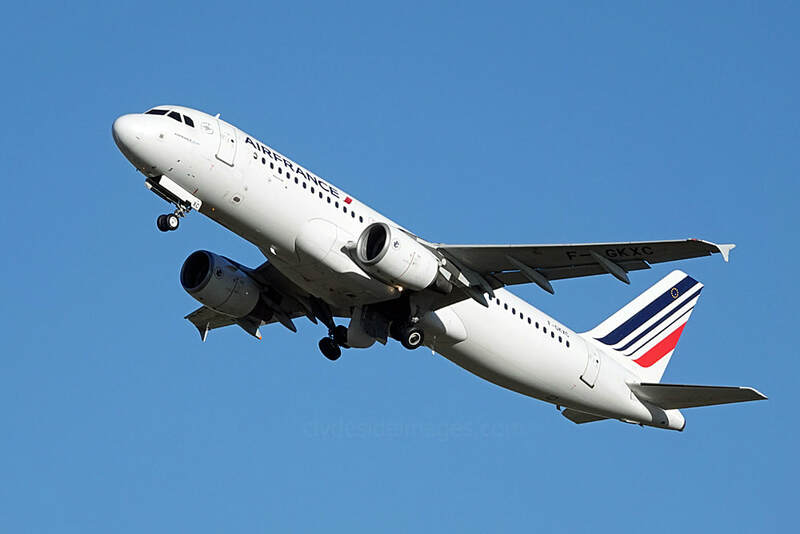 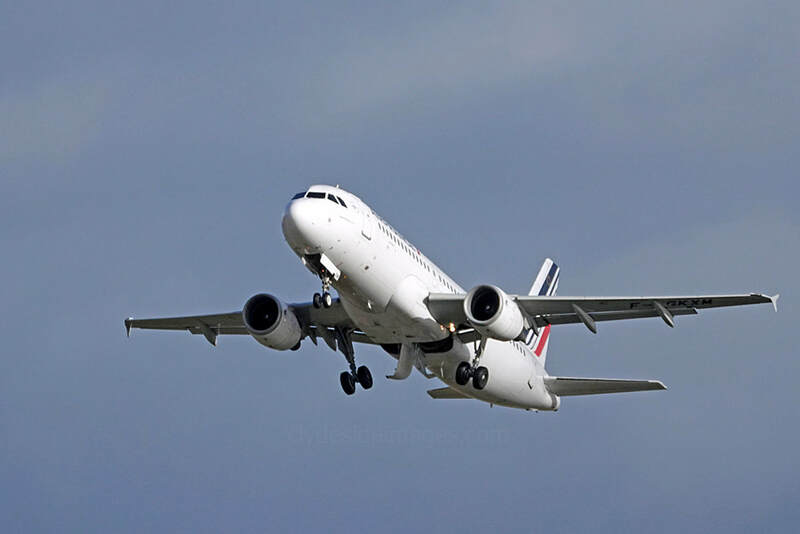 No doubt some French rugby fans were on board this scheduled Air France Airbus A320-214 F-GKXC which arrived from Paris - Charles de Gaulle - Same with HOP! 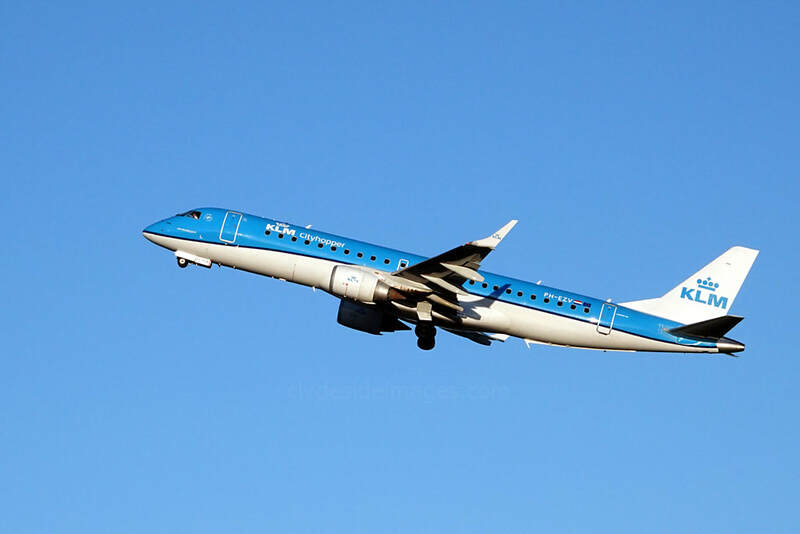 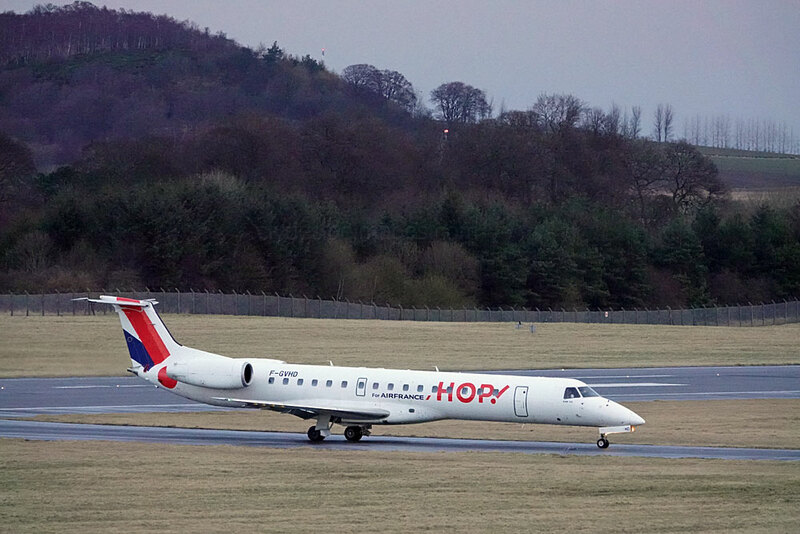 Embraer ERJ-145MP ​F-GVHD. 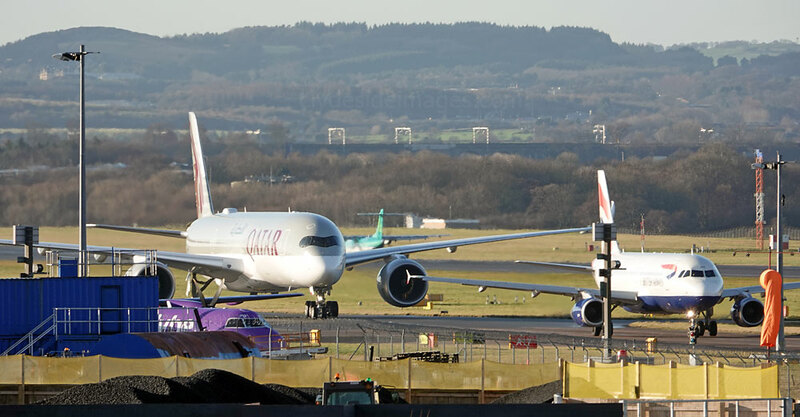 The only long haul airliners today were a Qatar Airways Dreamliner which took off around first light and United Boeing 757-224(WL) N12125. 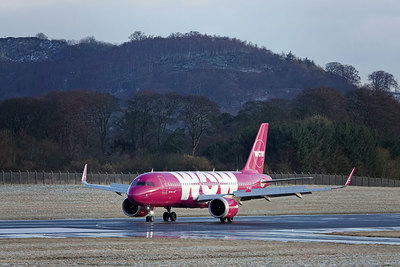 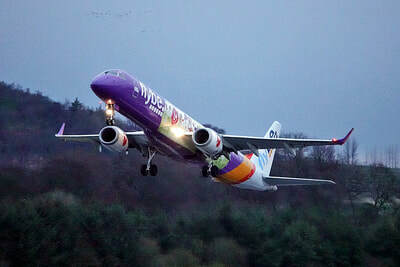 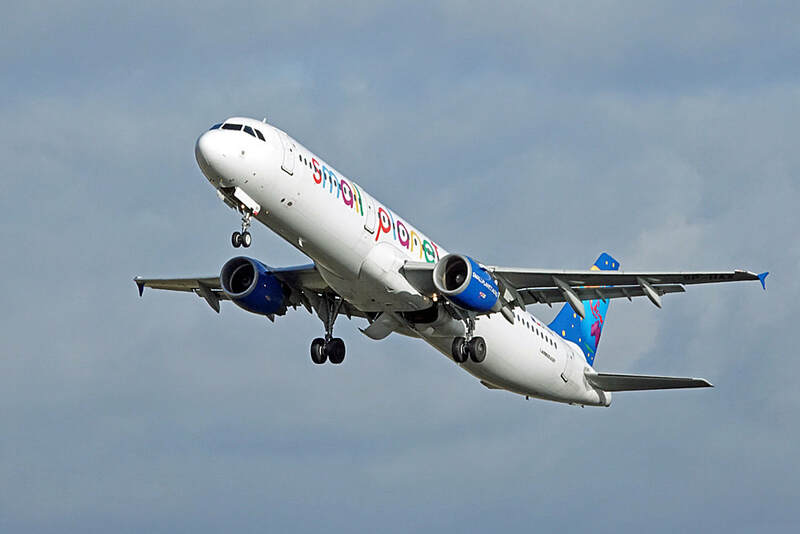 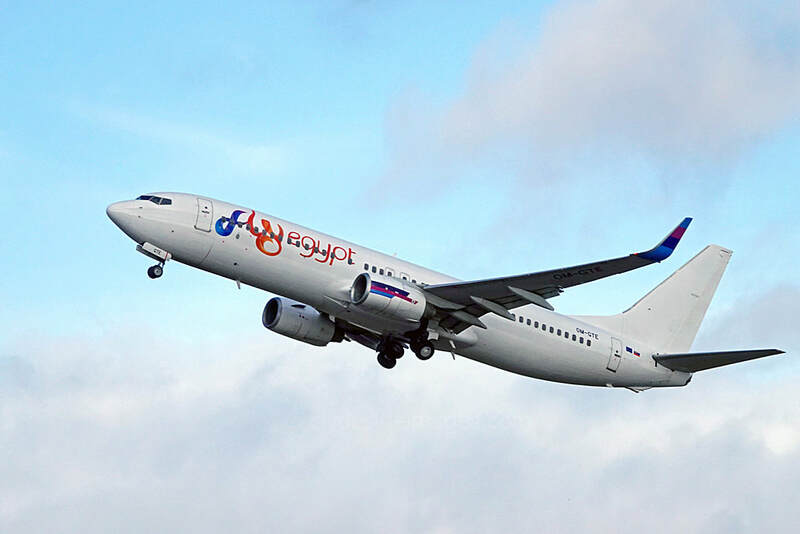 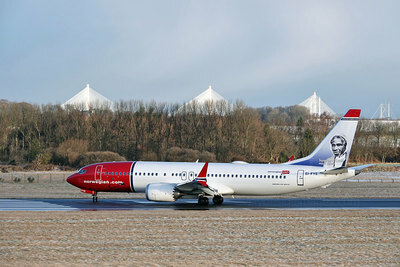 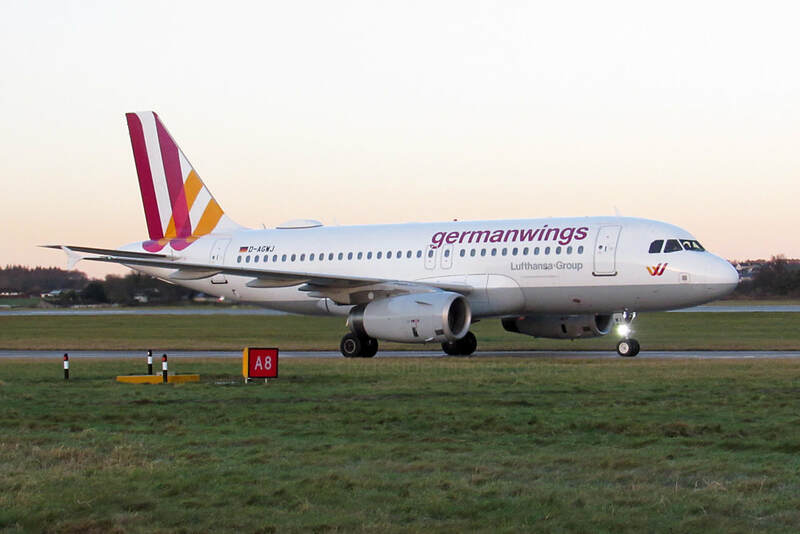 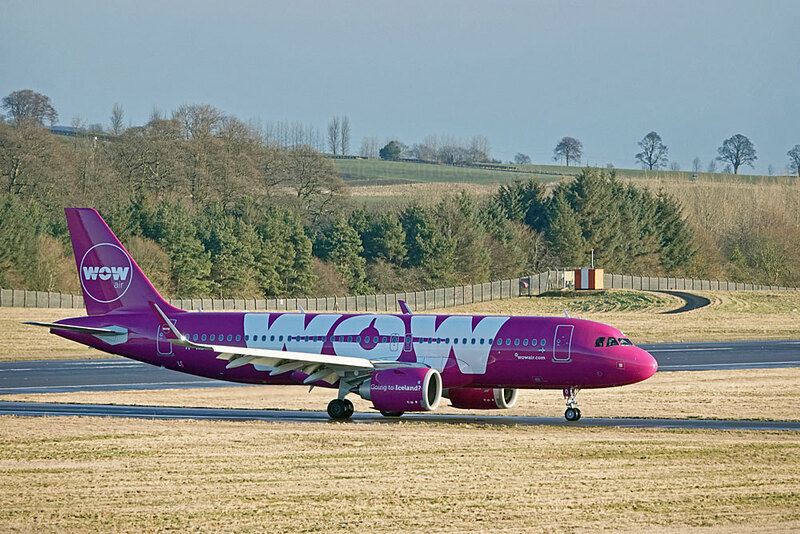 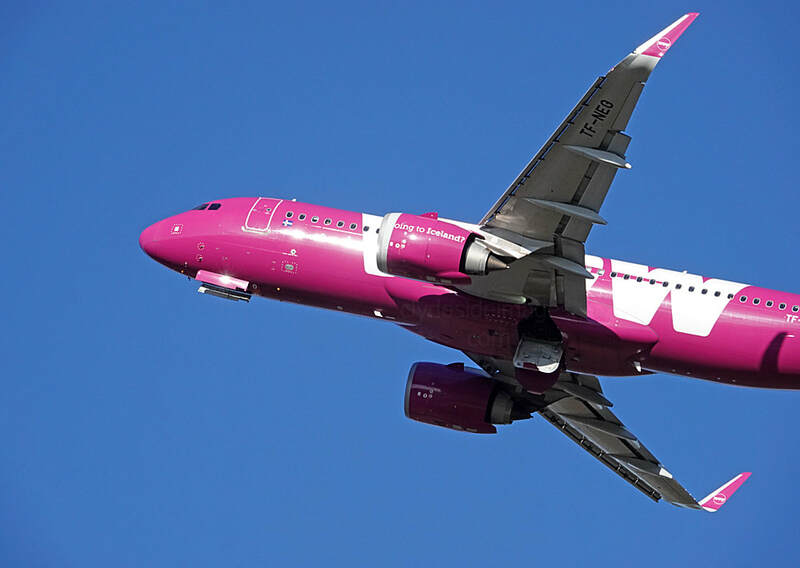 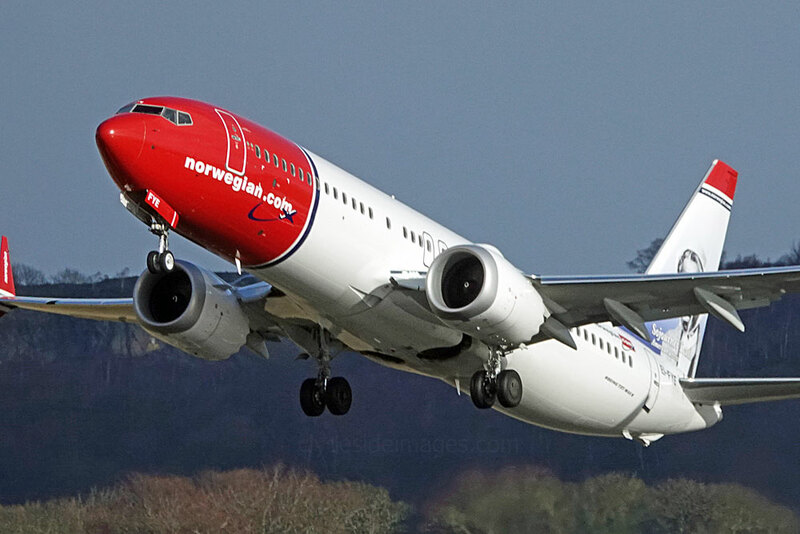 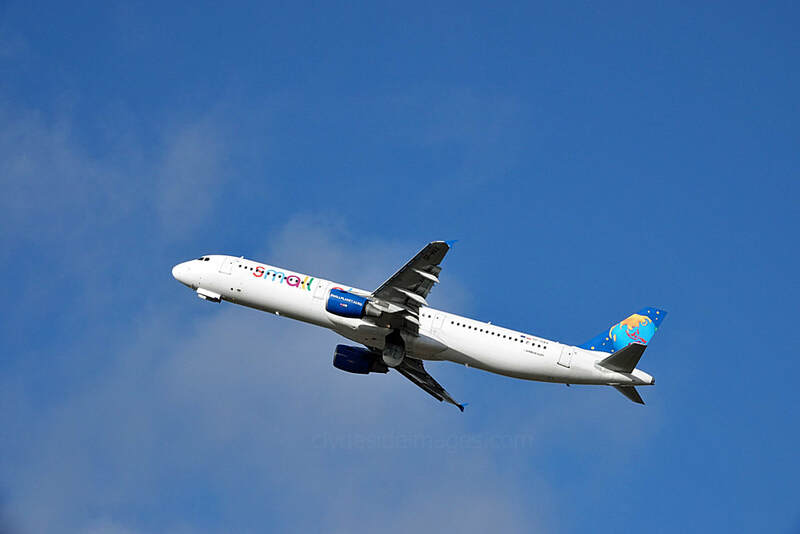 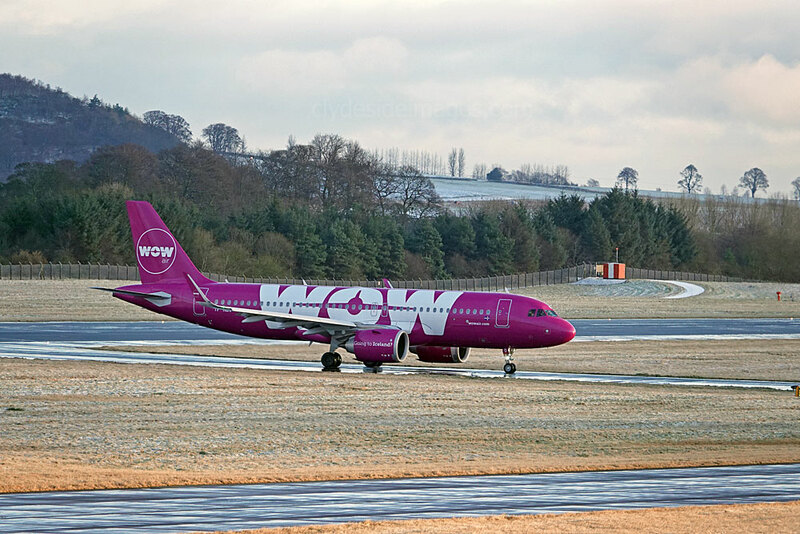 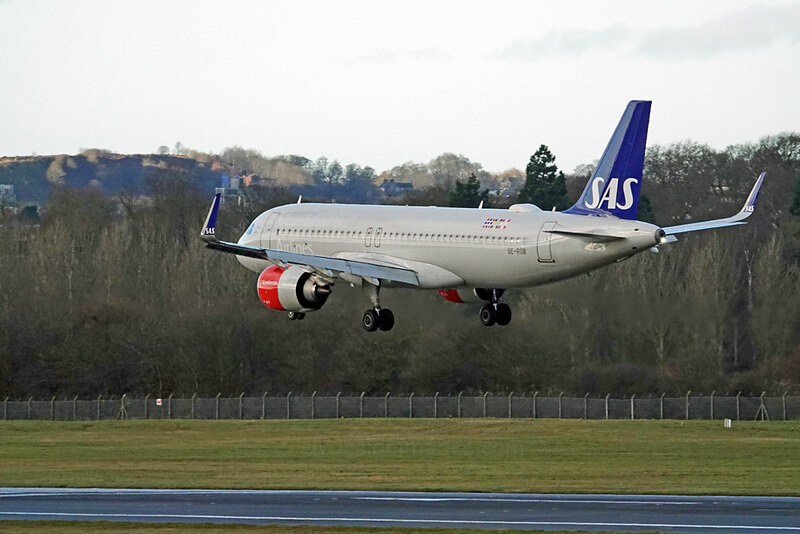 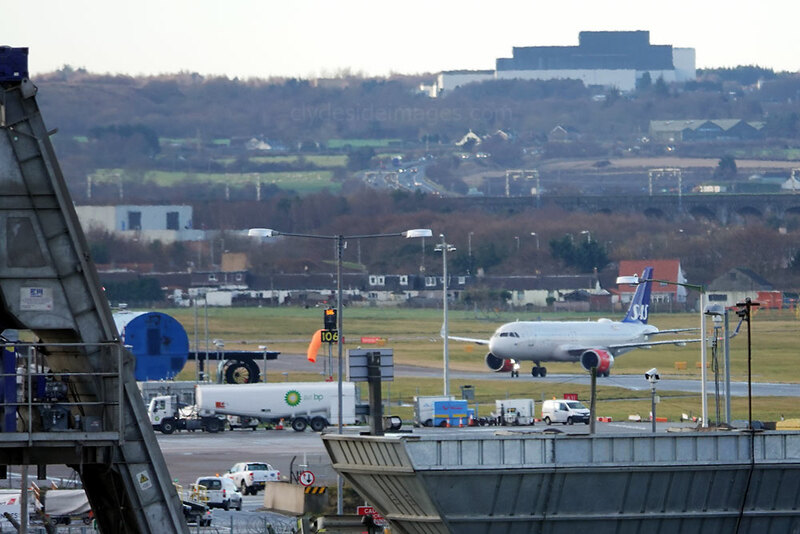 Icelandic low-cost carrier WOW Air became the first Airbus A321neo (new engine option) operator in Europe when it took delivery of its first variant, appropriately registered TF-NEO, at a ceremony during the 52nd Le Bourget Paris airshow last year. 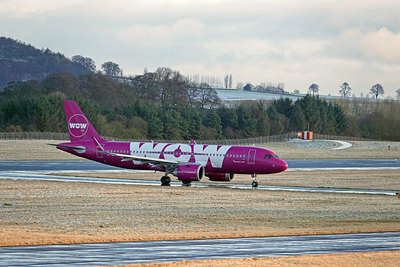 The aircraft, leased from Air Lease Corporation, was officially handed over to the airline’s Chief Executive Officer, Skúli Mogensen to join WOW air’s existing all Airbus Fleet of 15 A320 Family aircraft. 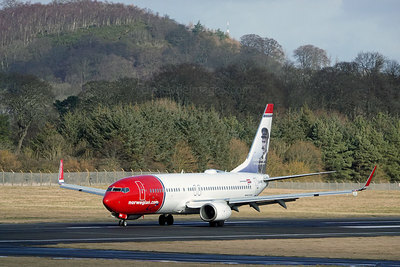 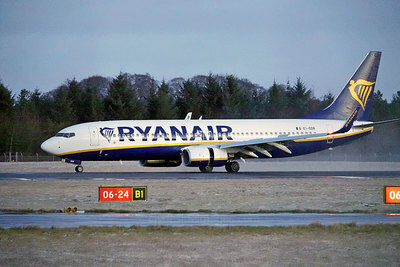 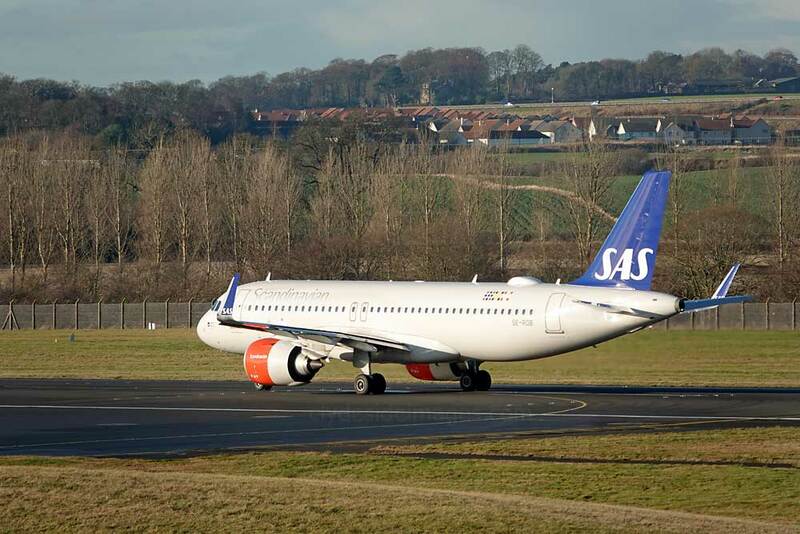 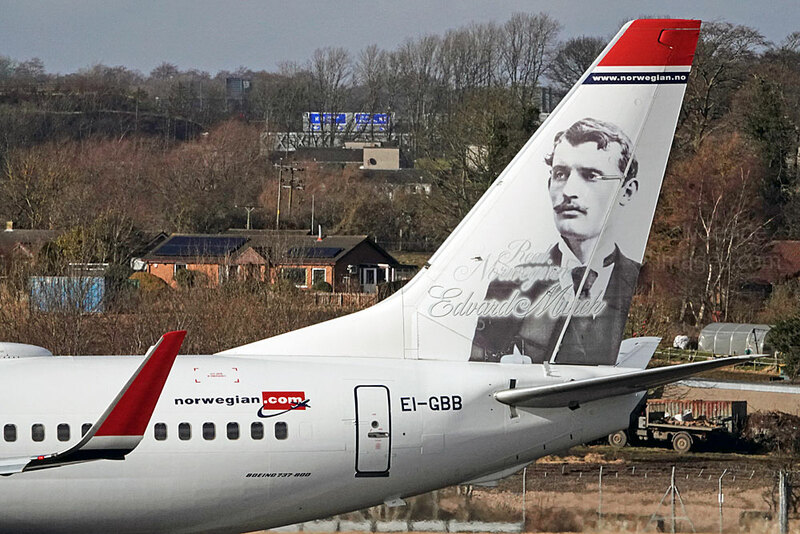 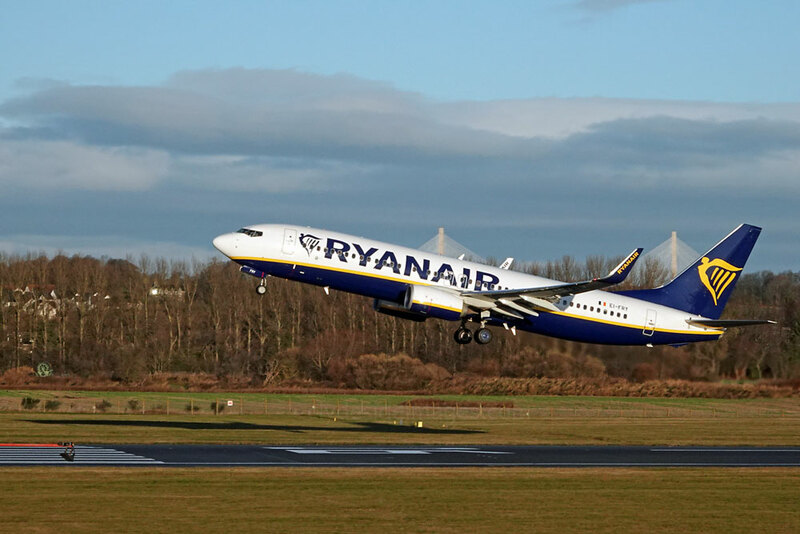 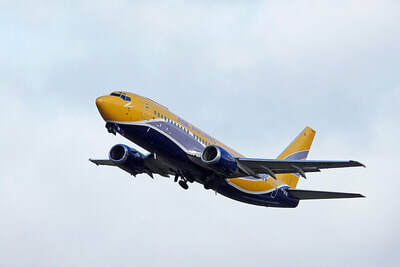 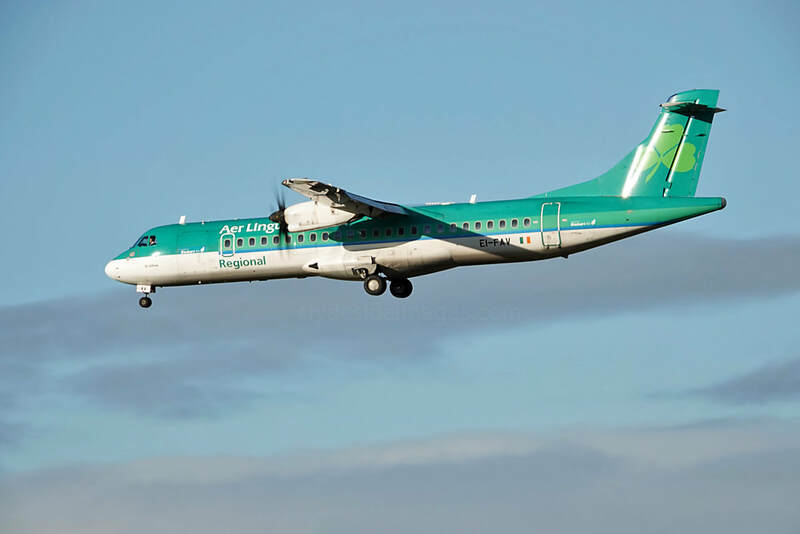 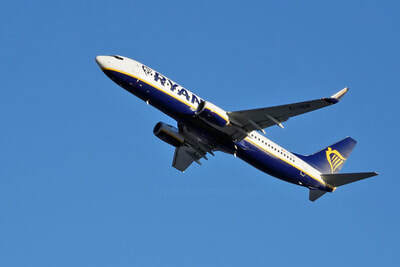 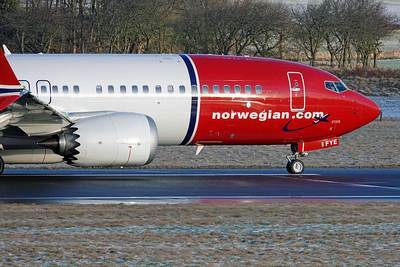 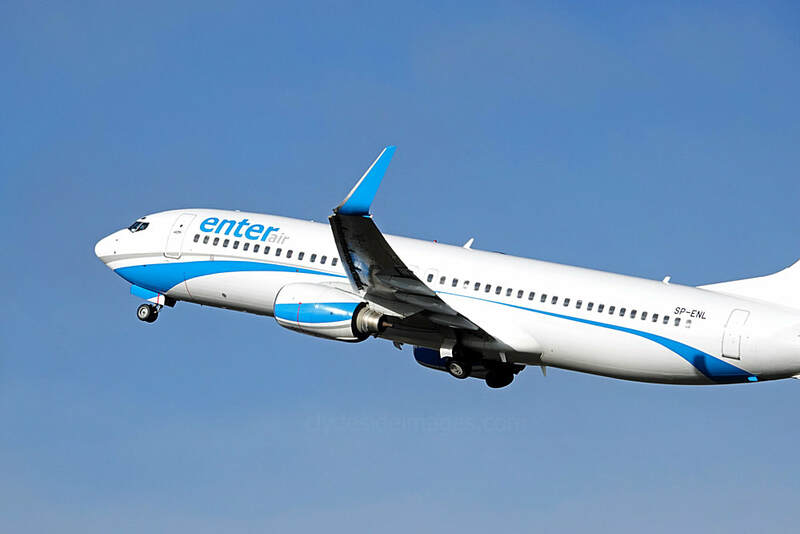 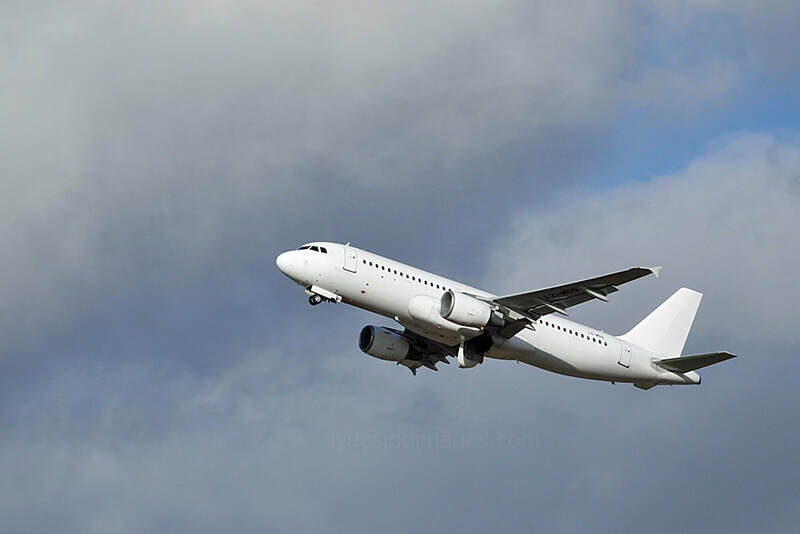 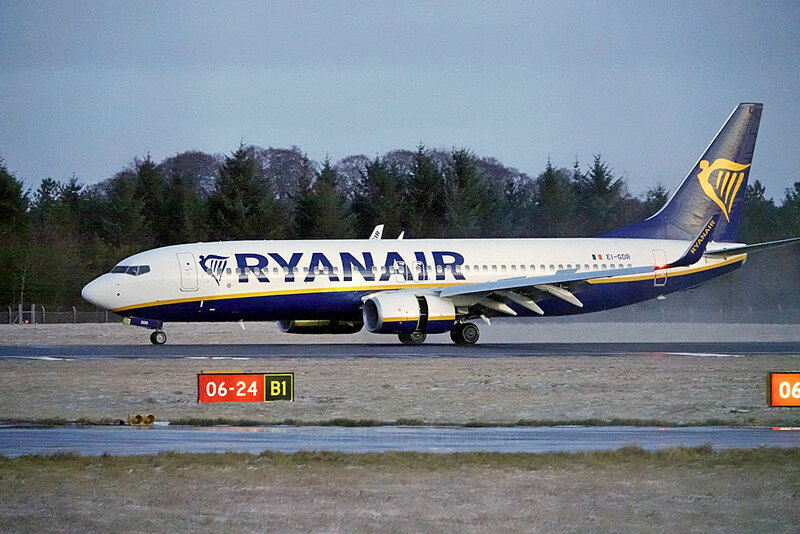 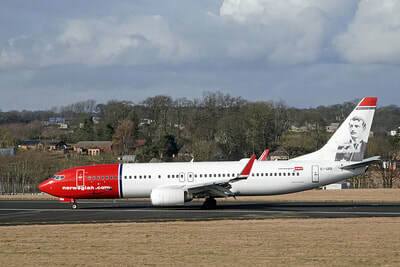 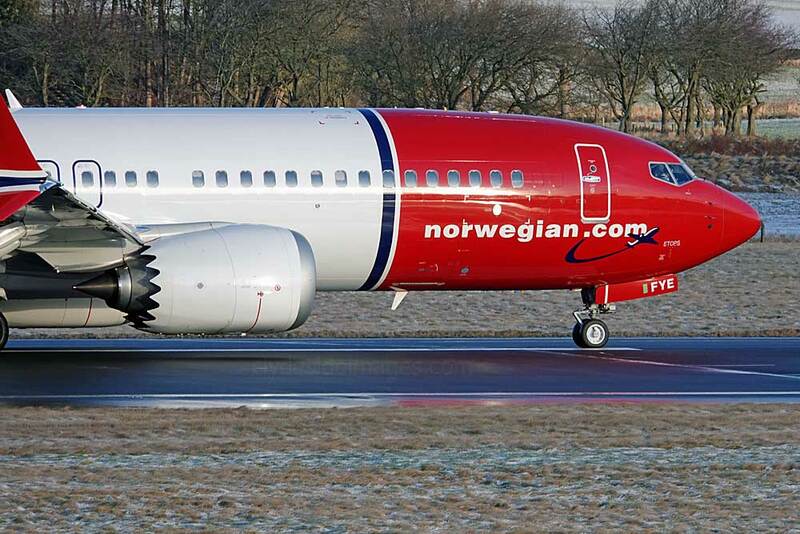 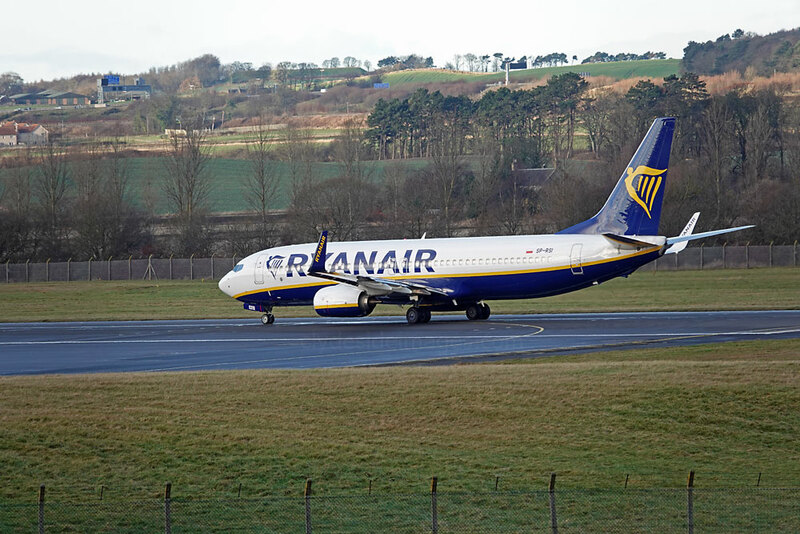 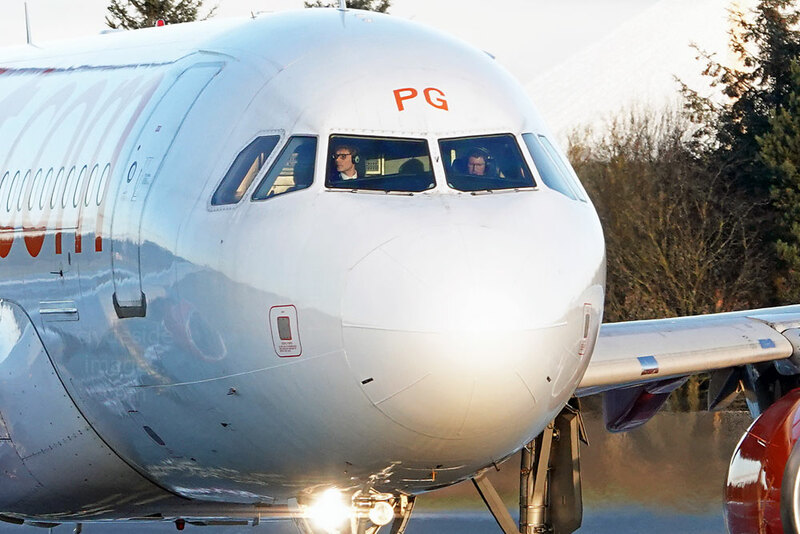 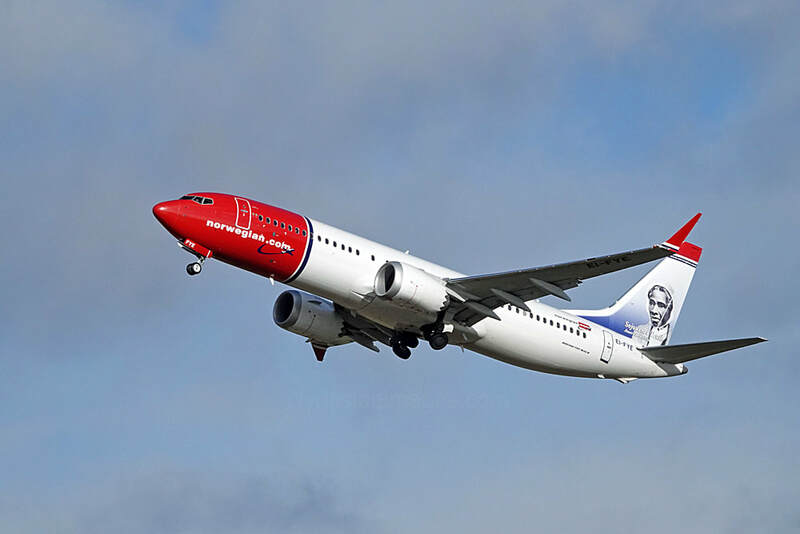 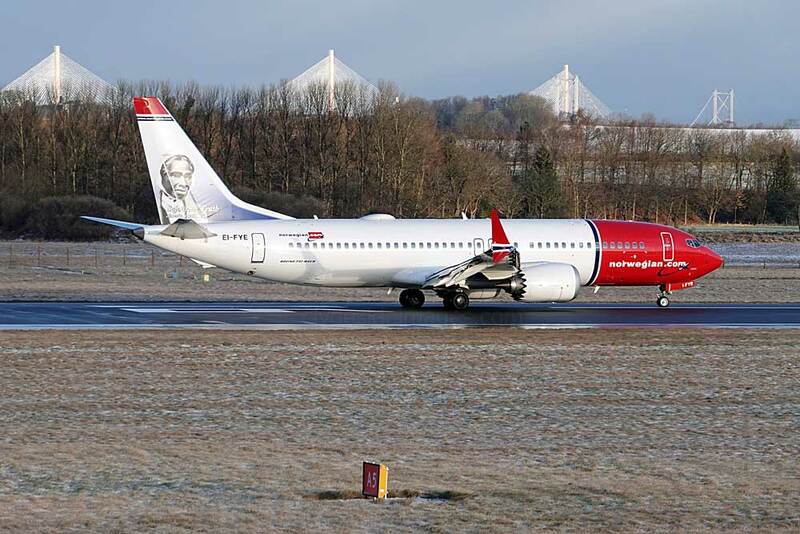 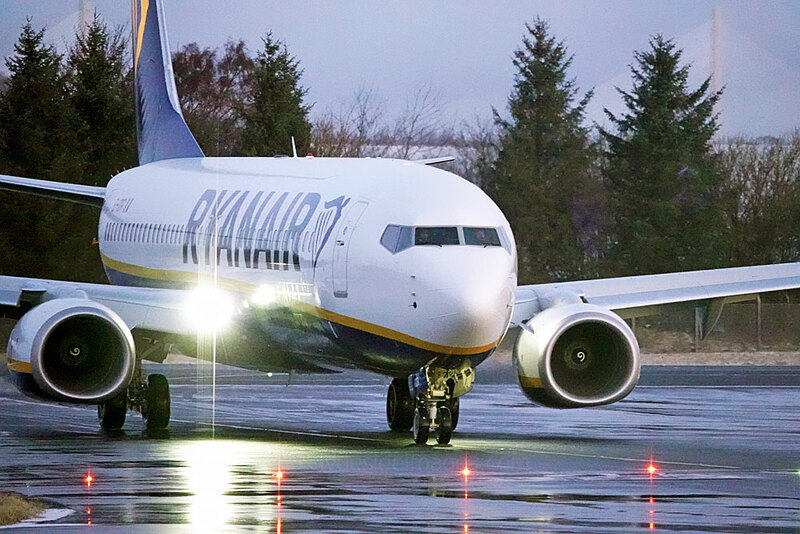 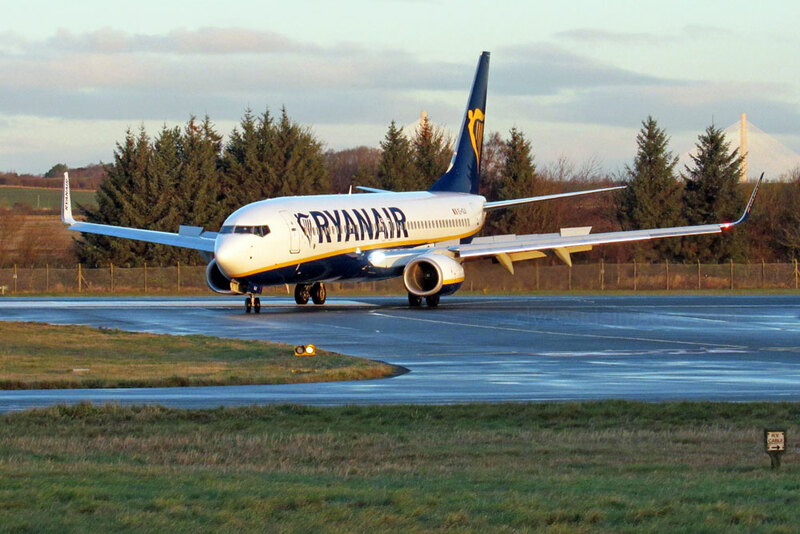 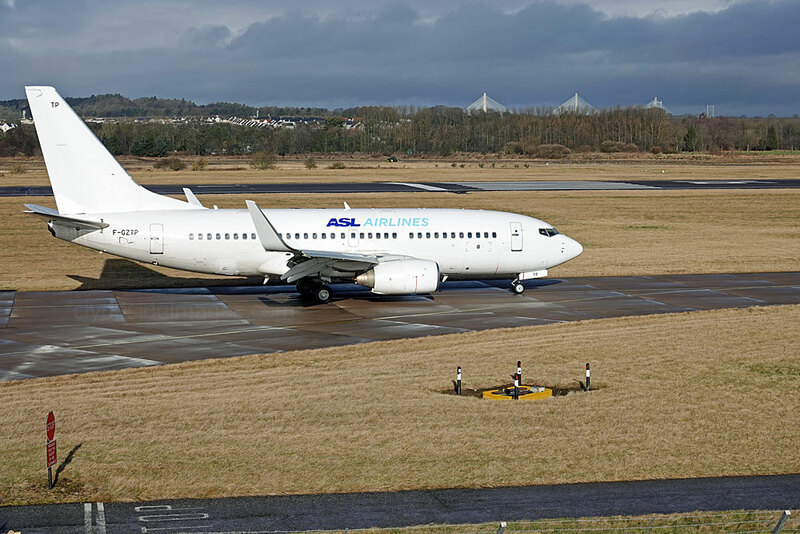 The latest addition to the fleet is based at Keflavik airport and operates commercial flights to and from Europe as well as to some destinations in North America. 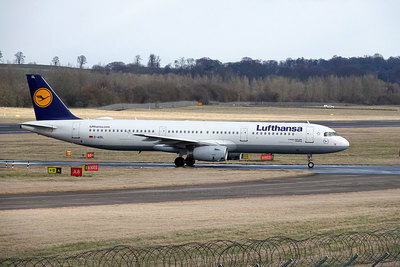 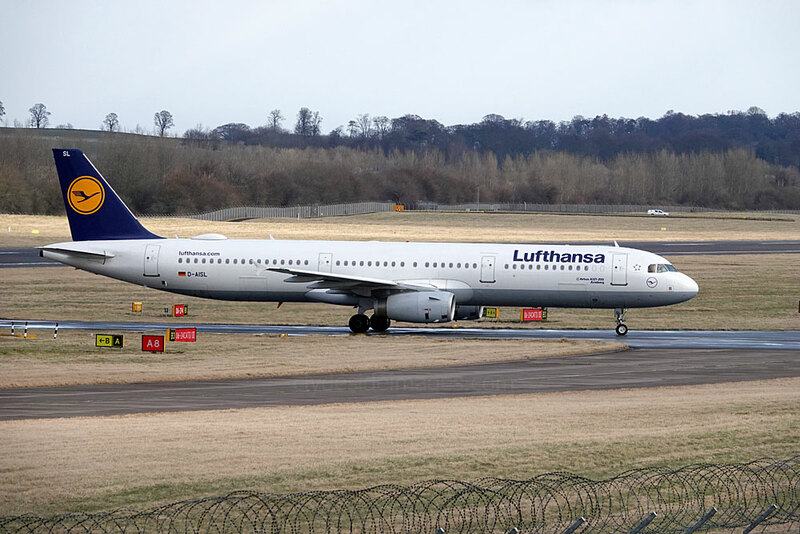 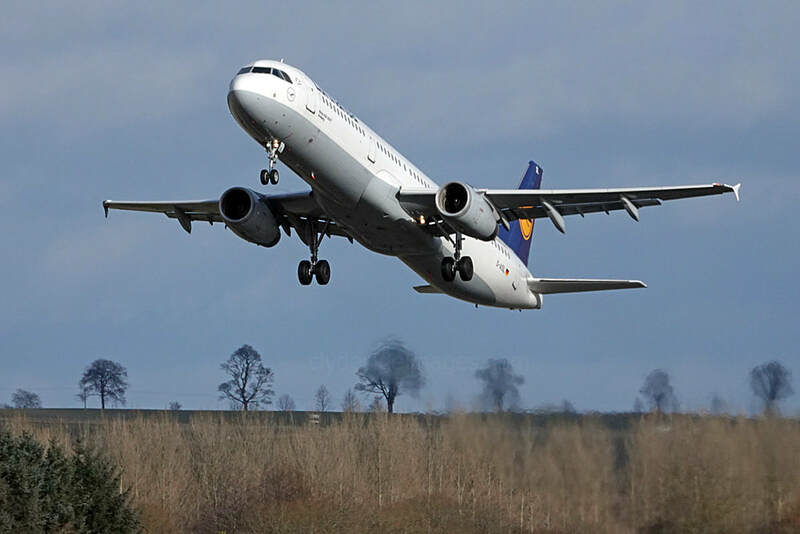 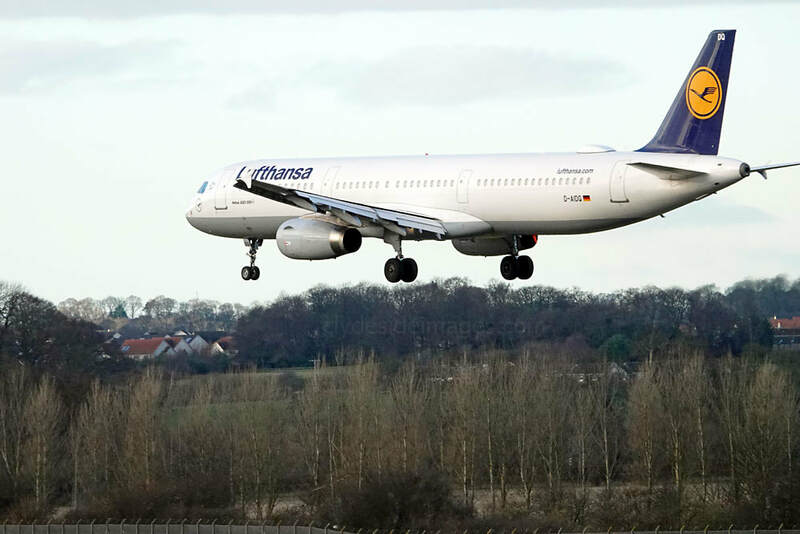 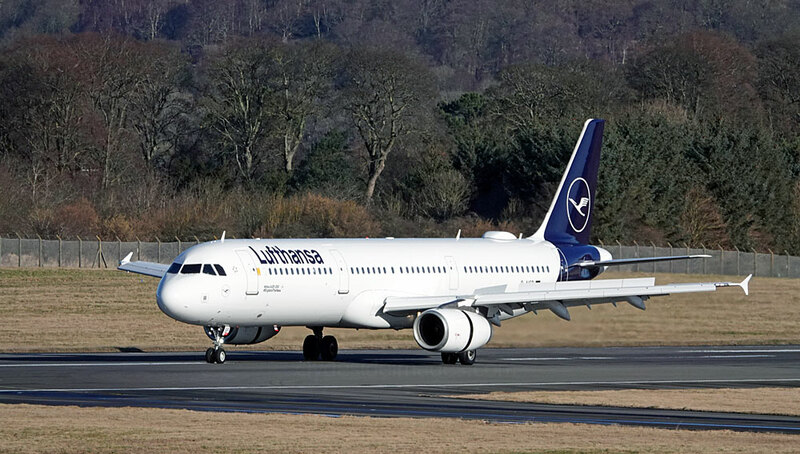 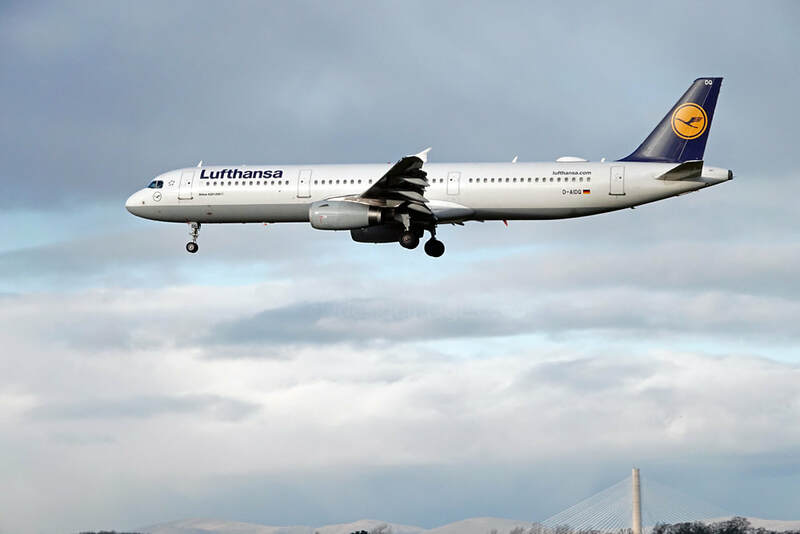 Lufthansa Airbus A321-231 D-AISP which had recently been painted in the airline`s new livery attracted a fair bit of interest. 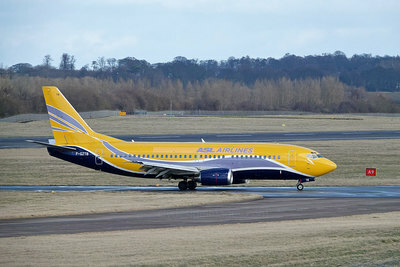 The new scheme has given rise to a great deal of adverse criticism with many people citing the lack of yellow, traditionally in the tail logo, contributing to a rather insipid appearance. 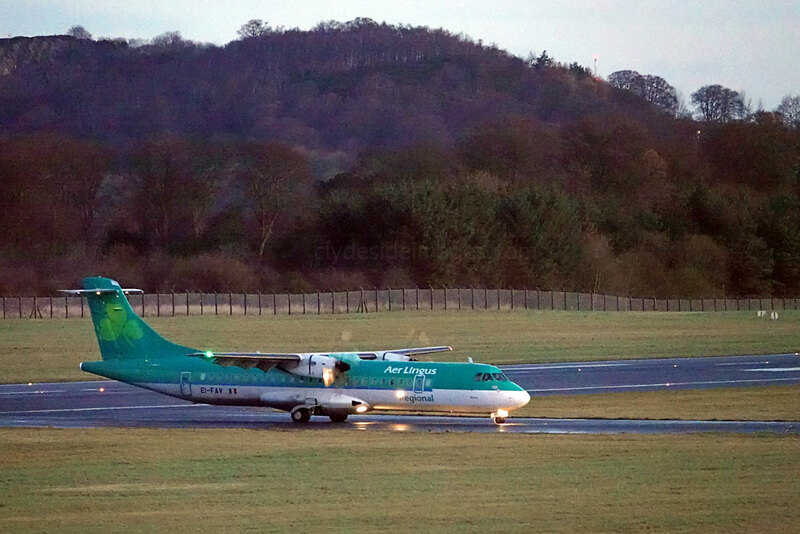 Planes, Trains but no Automobiles on this occasion. 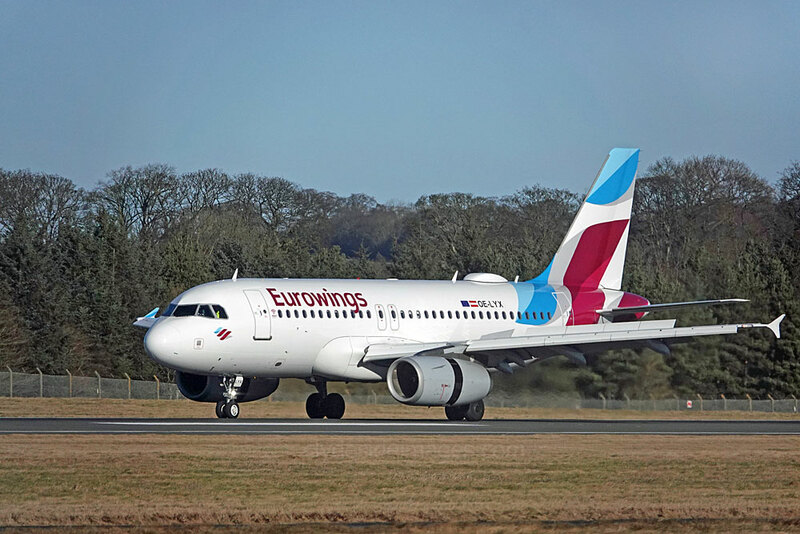 Additional views of Austrian-registered Eurowings Europe Airbus A319-132 OE-LYX and KLM`s Sky Team 737 PH-BXO on the 9th. 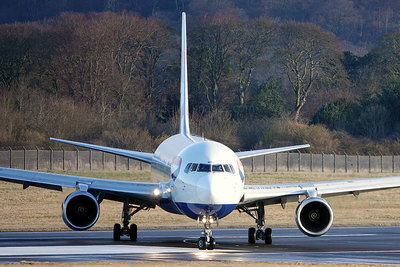 British Airways Boeing 767-336(ER) G-BNWB (above) worked a morning Shuttle flight to London Heathrow. 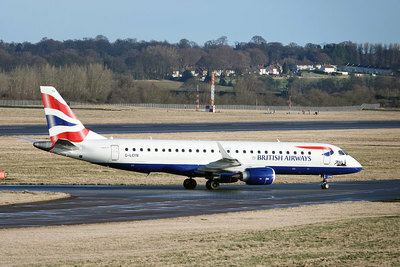 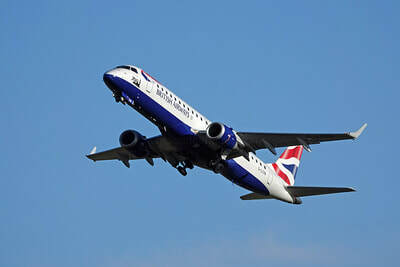 BA CityFlyer Embraer ERJ-190SR G-LCYL. 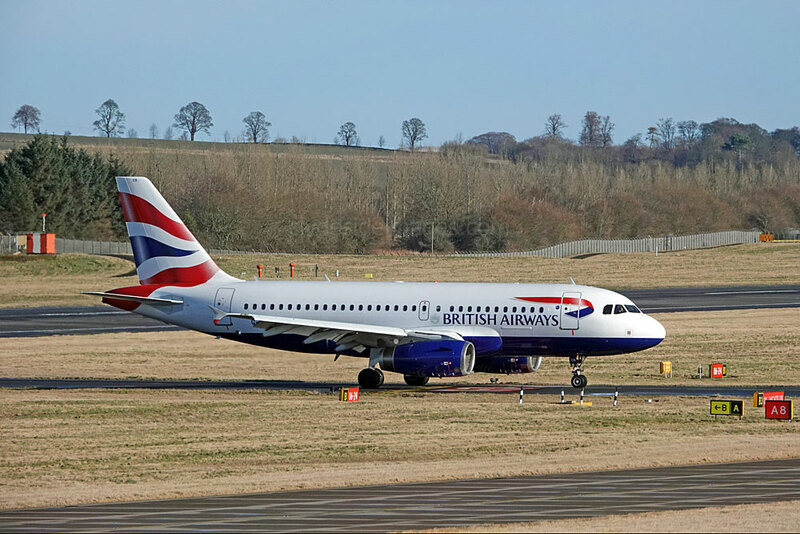 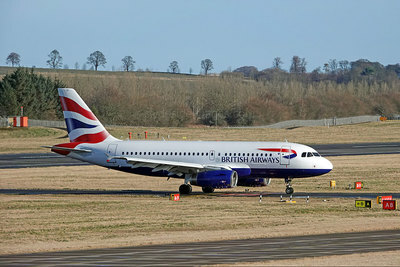 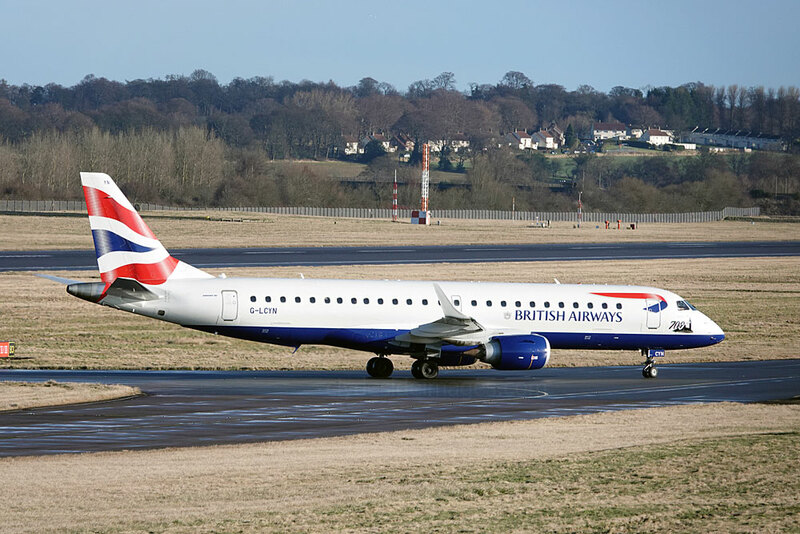 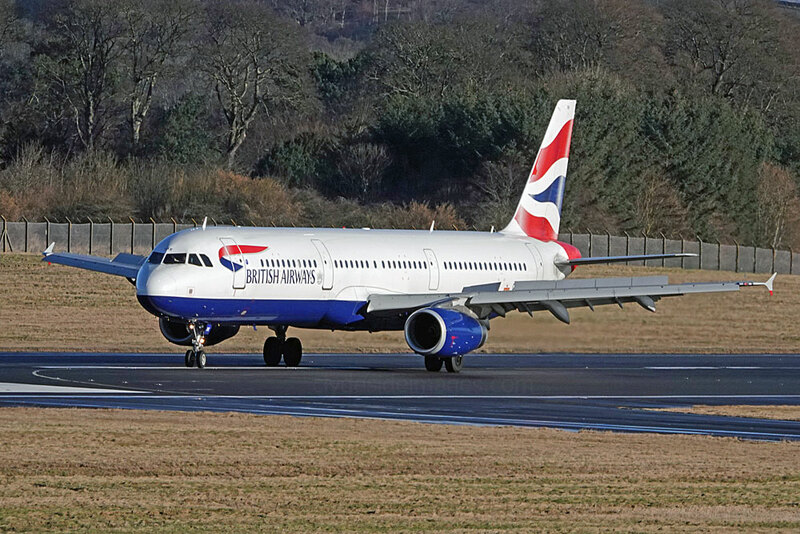 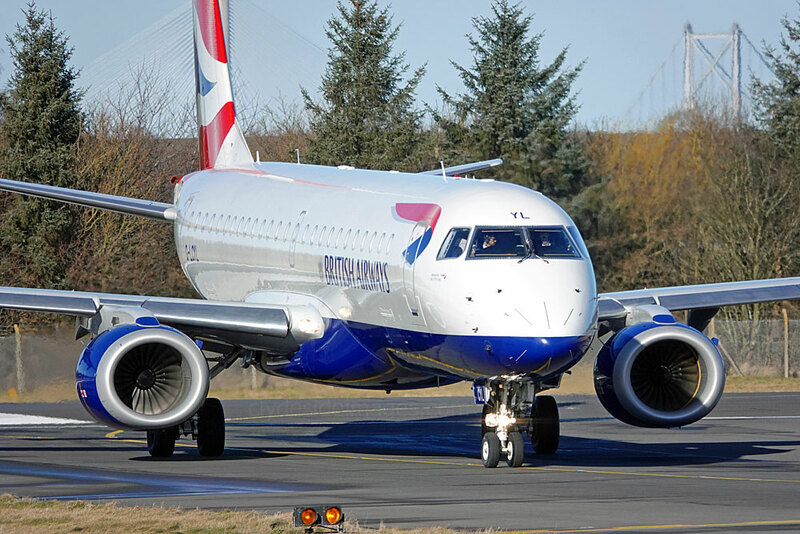 ​The logo on the nose of BA CityFlyer ERJ-190SR G-LCYN identifies it as the 700th Embraer ERJ to be delivered by the Brazilian aircraft manufacturer. 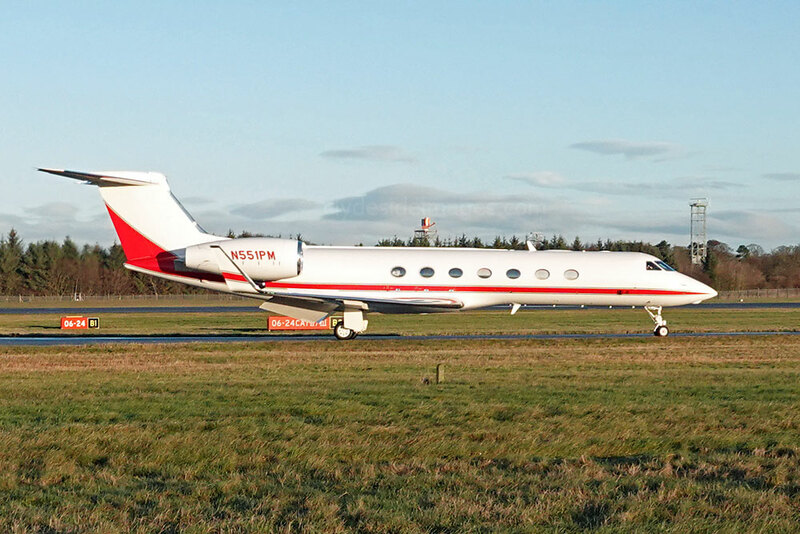 ​The only biz-jets photographed on the 9th were Manx-registered Cessna 525 CitationJet CJ2+ M-ICRC and NetJets` Cessna 680 Citation Latitude CS-LTA. 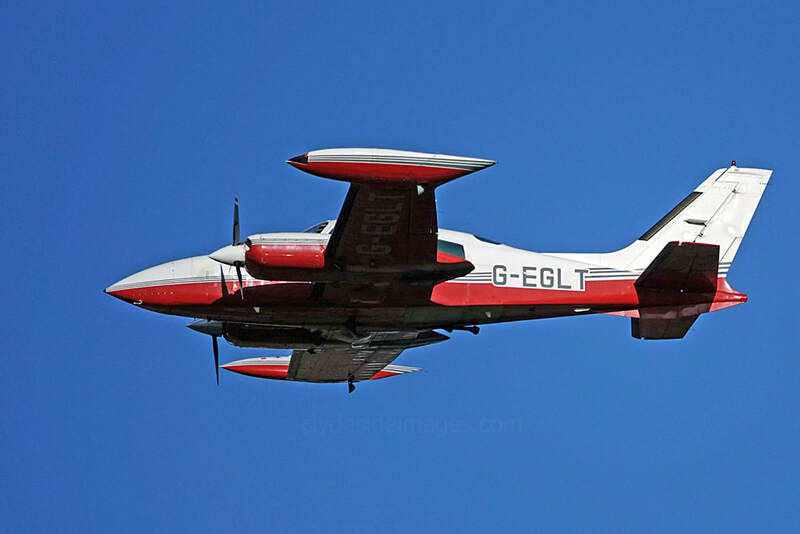 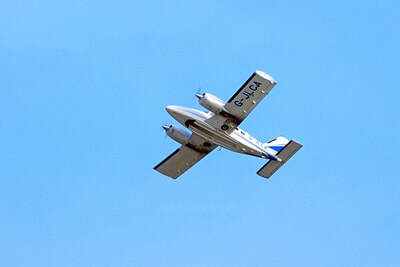 The only light aircraft photographed while I was at the airport on Friday 9 February was Cessna 310R​ G-EGLT which dates from 1980.